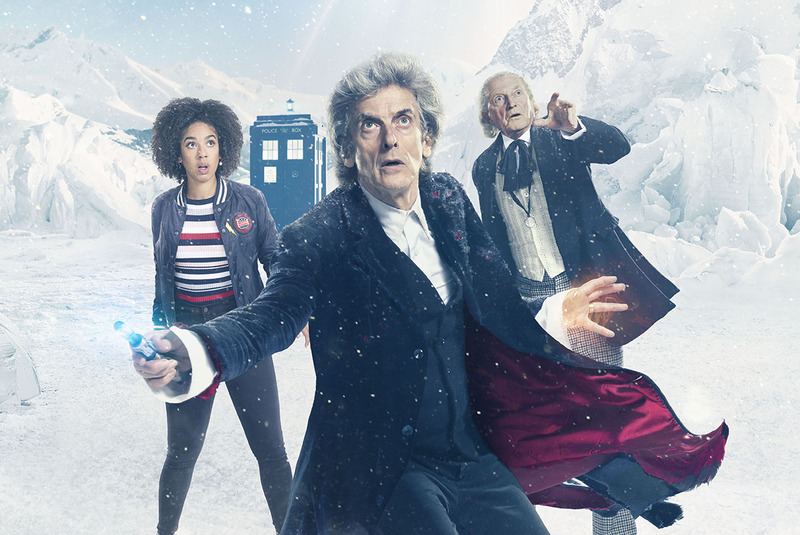 A glittering festive voyage awaits in this year’s Doctor Who Christmas Special: Twice Upon a Time as the 12th Doctor (Peter Capaldi) teams up with his original self, the first Doctor (David Bradley – Harry Potter, Game Of Thrones), and former travelling companion Bill Potts (Pearl Mackie) for one finale adventure in time and space. 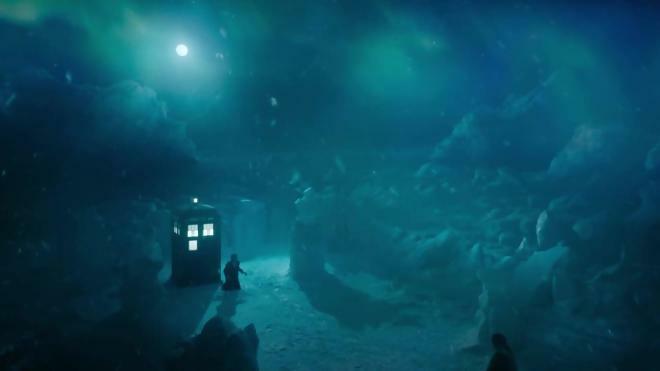 The two Doctors with one destiny meet in the frozen landscape of the South Pole, each stubbornly refusing to regenerate, but soon the Time Lords and their TARDISes must unite against mysterious enchanted glass people that have been snatching victims from frozen time. A First World War captain (Mark Gatiss), fated to die on the battlefield, is also plucked from the trenches to play a role in the Doctor’s story. There’s an emotional reunion with Bill Potts for the Doctor as well in this moving tale of hope during humanity’s darkest hour. Twice Upon a Time brings the 12th Doctor’s era to a spectacular close as the Time Lord confronts his past to embrace the future, before a new lifetime of adventures begins as Jodie Whittaker becomes the 13th Doctor! 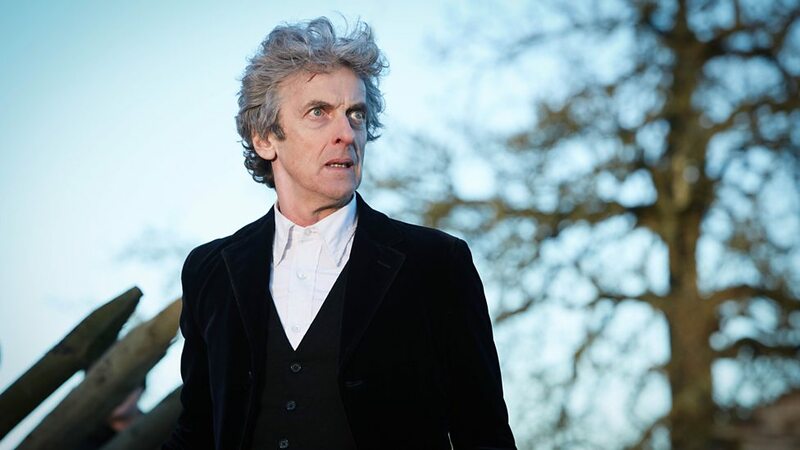 As well as being Peter Capaldi’s swansong after four years as the Doctor, Twice Upon a Time is also the final episode to be written by outgoing show runner of nearly eight years, Steven Moffat, and the special 60 minute episode is directed by the brilliant Rachael Talalay (Director of 2014’s Dark Water and Death in Heaven, 2015’s Heaven Sent and Hell Bent, and 2017’s World Enough in Time and The Doctor Falls). 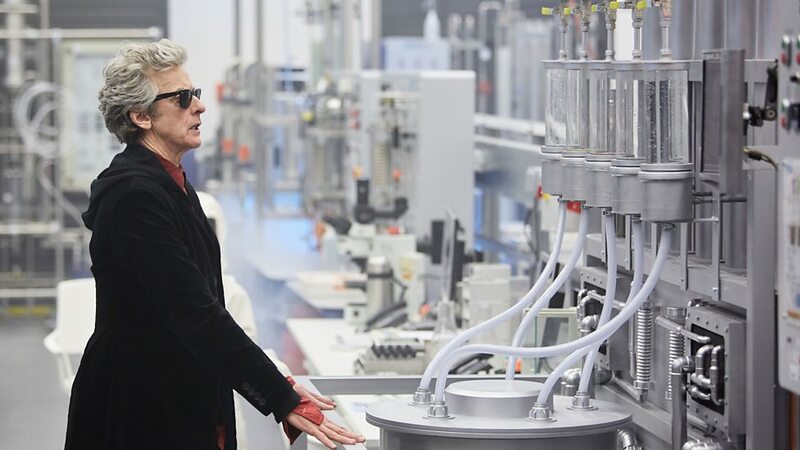 Peter Capaldi is on sparkling form in Twice Upon a Time as the Doctor struggles to hold back his regeneration. Tired of becoming other people his world is turned upside down when he encounters the first Doctor! From its wonderful opening recap of events from The Tenth Planet (1966) – the 1st Doctor’s final story which also featured the first appearance of the Mondasian Cybermen – Twice Upon a Time magically revisits this momentous point in the programmes history via original footage, some digital wizardry, recreations of the Snow Cap Base and the interior of the Cyber-Ship, together with David Bradley in the role of the 1st Doctor (originally played by the late William Hartnell who Bradley also portrayed in 2013’s An Adventure In Space and Time, and featuring Jared Garfield and Lily Travers in the roles of the 1st Doctor’s companions Ben and Polly. “Its far from being all over” for the pre-regenerative Doctors just yet, as this Christmas Special sends the Time Lords to the South Pole in 1986, the Western Front in 1914, a spaceship, and ruins on a distant alien world at the heart of the universe. 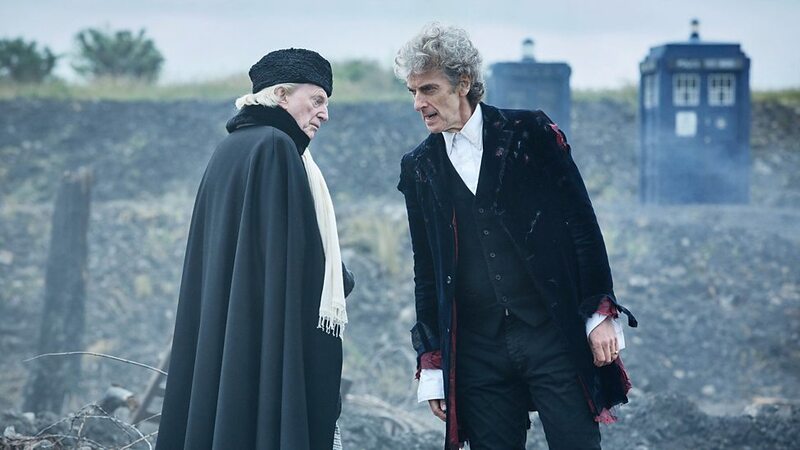 The fabulous chemistry between Peter Capaldi’s 12th incarnation and David Bradley’s 1st Doctor positively lights up the screen. It creates a really fun and spiky dynamic too as each Doctor confronts the reality of who they were and who they will ultimately become. At times the 12th Doctor is clearly embarrassed and frustrated by his former self‘s old fashioned attitude, while the 1st incarnation is aghast as his future self’s reliance on sonic sunglasses and the like, making for some delightful moments that are sure to raise a wry smile – especially when Bradley’s Doctor steps inside his 12th incarnations TARDIS! The 12th Doctor epitomises the heroic force of nature that the Doctor has become, while the 1st Doctor is the adventurer he was before he fully became Earth’s protector, each has their own strengths and flaws, but it is their journey together and the respect they gradually find for each other that makes Twice Upon a Time feel truly magical. 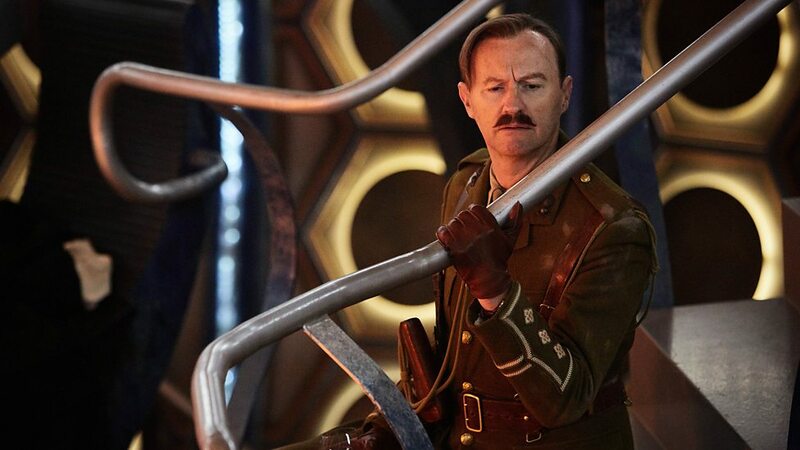 Prolific writer and guest star of Doctor Who, Mark Gatiss, also gives a strong performance as the British captain taken away from a bomb crater frozen in time during the Great War as he was confronting a wounded German soldier (played by fellow Doctor Who writer Toby Whitehouse), and his subsequent adventure with the two Time Lords and Bill has a profound affect on how events gradually unfold in the episode – even influencing the Doctor’s own timeline. 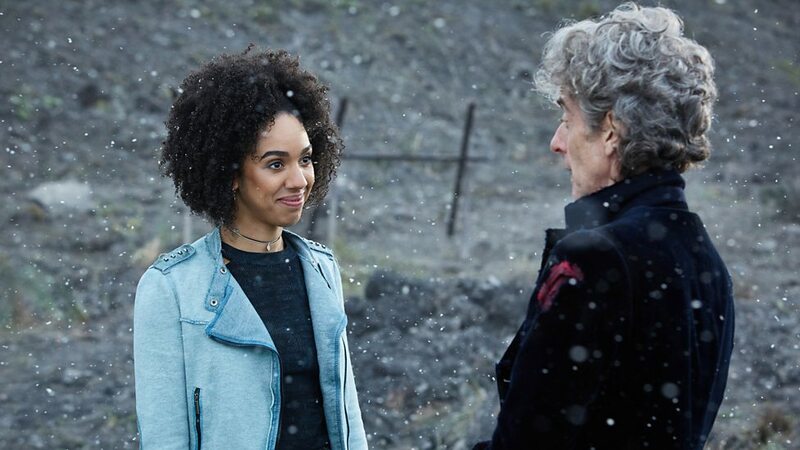 It’s great to see Pearl Mackie back as Bill Potts for the Christmas Special as well. Her character was the undisputed highlight of Season 10, and Mackie excels once again in the role of the Doctor’s former travelling companion. 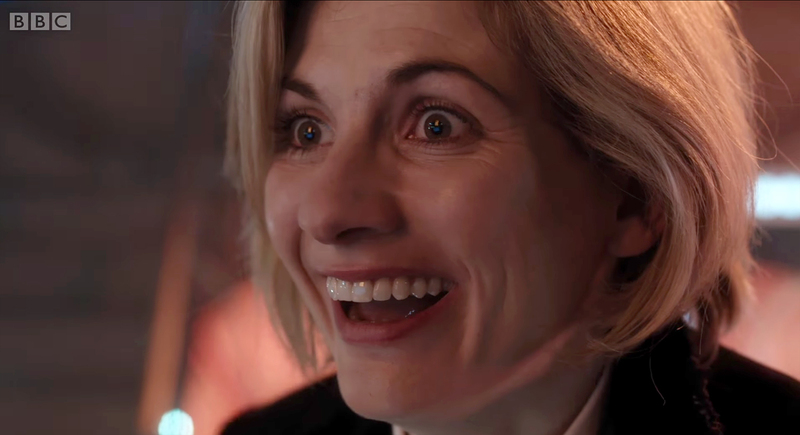 She also gets to meet the Doctor’s original self, her scenes with the 1st Doctor are glorious fun, especially when the action shifts to the original TARDIS (Its interior recreated in exquisite detail), but it is the moving reunion of the 12th Doctor and Bill and the dynamic between their characters that really steals the show. Twice Upon a Time brings a nice sense of closure to Bill’s time with the Doctor, and I’m so glad Moffat brought her back for Capaldi’s last story. Unusually there are no real monsters of bad guys to speak off in Twice Upon a Time, aside from the eponymous Glass Woman that’s actually an advanced AI controlling the Testimony, whose vast spaceship takes people out of time to harmlessly record their memories before death and returning them to their fate. They’ve now set their sights on the 12th Doctor’s TARDIS because the captain has somehow become removed from time to and embroiled in the Doctor’s adventure, and they must return him to his proper place in time. Its only when the Time Lords, the captain, and Bill escape in the 1st Doctor’s TARDIS to the most comprehensive database in creation at the centre of the universe – controlled by Rusty the Dalek from 2014’s Into the Dalek – that the 12th Doctor finally realizes there is no foe to fight as Bill reveals she is part of the Testimony as well. 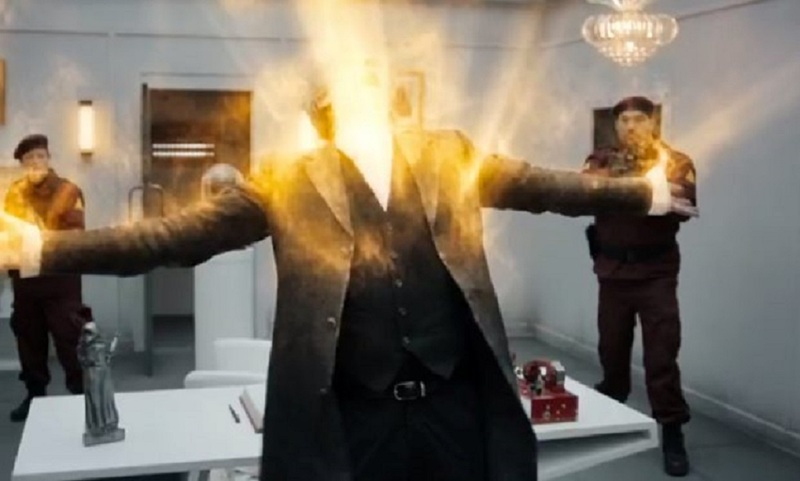 Along with providing a fittingly epic finale for Capaldi’s era, Moffat peppers the scrip with numerous call-backs to various elements created during his tenure as show runner, but Twice Upon a Time never feels overly burdened by the need to explain every obscure nuance or overloaded with gratuitous continuity references. Twice Upon a Time is easily one of Steven Moffat’s finest scripts for the series. It works on so many levels, profound underlying themes resonate powerfully, there’s a beautifully philosophical speech for the 12th Doctor, and it brings some mystery back to the Time Lord while celebrating his past and of course some emotional goodbyes. Its all impressively directed by Rachael Talalay, from the battle scarred landscape in WWI, to the glimpses of the Doctor’s other incarnations the 1st Doctor witnesses in the Testimony spaceship, and of course that beautifully nostalgic original TARDIS interior, Talalay brings Moffat’s script to life amidst a wealth of stunning action set-pieces and dazzling special effects to ensure this Doctor Who Christmas Special provides a rousing send off for both showruner and leading actor. With the timeline in Ypres 1914 restored amidst the Christmas Armistice the Time Lords also discover that the captain is actually Archibald Hamish Lethbridge-Stewart (an ancestor of Brigadier Lethbridge-Stewart), and he asks the Doctors to look after his family. As the 1st Doctor and 12th Doctor finally go their separate paths to face their regenerations Twice Upon a Time will have made you laugh, it will almost certainly have tugged at your heartstrings too, and there’s even a surprise return appearance from Jenna Coleman as Clara Oswald and Matt Lucas as Nardole to bid a fond farewell to the 12th Doctor as well before that moment of regeneration finally arrives and Capaldi’s spiky eyebrows and fierce-yet-sad eyes blaze away as the Time Lord becomes Jodie Whittaker – the female incarnation of the Doctor! Her debut is, quite frankly, “oh brilliant”, and the turbulent cliff-hanger aftermath of the regeneration will leave you on the edge of your seat with anticipation for the beginning of the 13th Doctor’s adventures! Now the stage is set for Series 11 and the beginning of Chris Chibnall’s tenure as Doctor Who’s show runner. The new season will comprise of ten week run of fifty minute episodes (with an hour long episode for the series launch) that will air in the Autumn of 2018. I’m sure Jodie Whittaker will be fantastic as the new Doctor, she was great in Broadchruch, and no doubt her portrayal of the Doctor will be just as riveting and special. The 13th Doctor will be joined by a regular cast of new friends, including Bradley Walsh as Graham, Tosin Cole as Ryan, and Mandip Gill as Yasmin. We’ve already seen the 13th Doctor’s new costume and the TARDIS exterior (it reminds me a lot of the TARDIS exterior from the 1975 classic series story Planet of Evil) in publicity pictures, we can be sure that Chris Chibnall has plenty more surprises in store for us, and I can’t wait to see the 13th Doctor and her friends new adventures in Time and Space in 2018! And here’s that fantastic regeneration scene! The Doctor Who Christmas Special Twice Upon a Time! Two Doctors, one destiny! The magical final chapter of the Twelfth Doctor’s journey is coming. Don’t miss ‘Twice Upon a Time’ this Christmas! As part of the BBC’s annual Children in Need live charity fundraising event on BBC One, Doctor Who fans were treated to a preview clip of the Doctor Who 2017 Christmas special Twice Upon a Time! Written by Steven Moffat (his last story before Broadchurch creator Chris Chibnall takes over as show runner) and directed by Rachel Talalay, Twice Upon a Time is also Peter Capaldi’s final adventure as the 12th Doctor before he regenerates into 13th incarnation played by Jodie Whittaker. 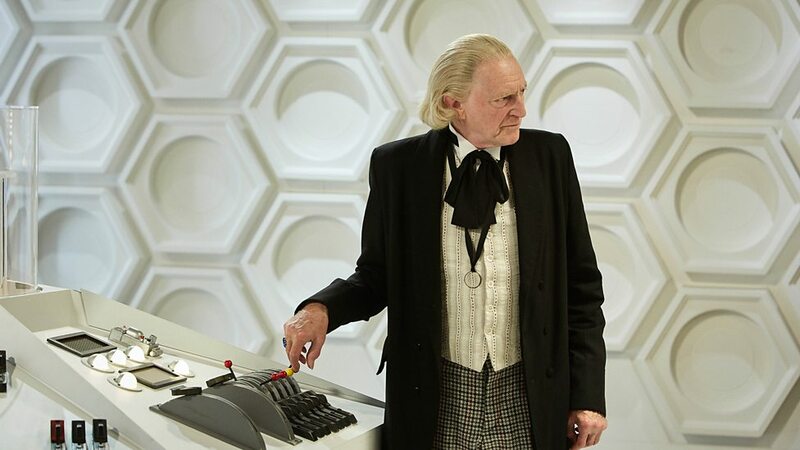 Twice Upon a Time also features David Bradley as the 1st Doctor, Pearl Mackie as Bill, and Mark Gatiss as a World War I solider known as ‘The Captain’ Check out the special preview clip, where the 1st Doctor enters the 12th Doctor TARDIS first show on Children in Need! Can’t wait for this Doctor Who Christmas Special! A close friendship for the Doctor will become the catalyst for his most impetuous decisions of all time… In her bid to change her evil ways, Missy has joined the Doctor, Bill, and Nardole on their adventures in the TARDIS. When they become trapped on a gigantic spaceship caught in the gravity of a black hole, the Doctor faces the demise of someone he’s sworn to protect. But on this ship of uncanny life forms, where even time is working against him, old enemies await – the Mondasian Cybermen and the Master! 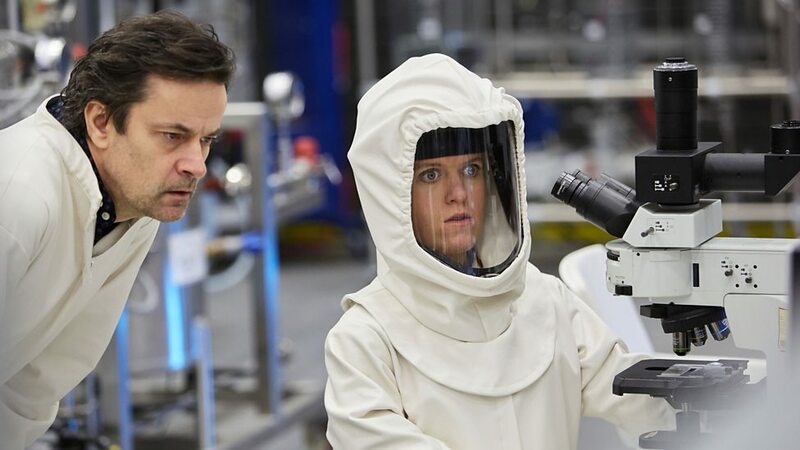 The inexorable path to the end of an era begins in the penultimate episode of series ten, World Enough and Time, the first part of the series finale, written by show runner Steven Moffat, and directed by Rachael Talalay (The director of the two-part 2014 series finale Dark Water and Death in Heaven, along with 2015’s Heaven Sent and the series nine finale Hell Bent. As the title for World Enough and Time suggests, it’s a reference to a poem by Andrew Marvel, entitled To His Coy Mistress, the lines of which resonate strongly with Missy’s role and the Vault story-arc that has been so prevalent across the entirety of series ten. Kicking off with a startling pre-titles sequence as the Doctor emerges from the TARDIS into a frozen snowscape where he begins to regenerate, World Enough and Time is an episode that hit’s some powerful emotional beats right from the outset, and from there Steven Moffat’s taut script doesn’t let up the pace for a moment. In deciding to give Missy the chance to explore her newfound goodness as part of her rehabilitation, the Doctor lets her take the lead in a mission to save a 400 mile long colony spaceship attempting to reverse away from a black hole. 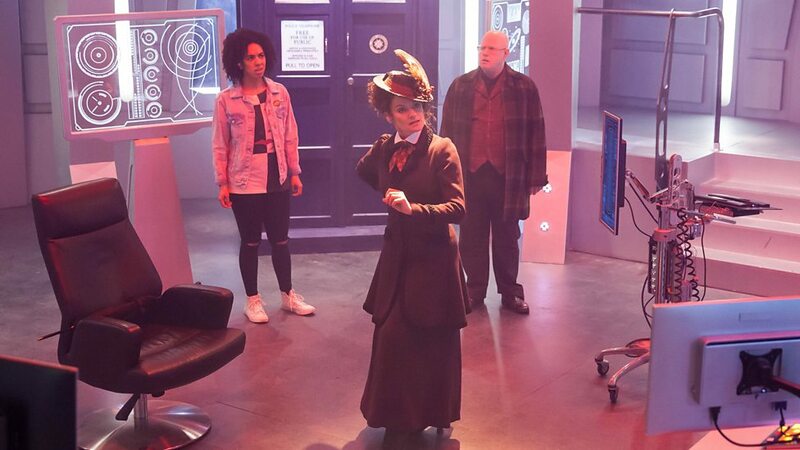 Yes, there’s a new Doctor, In-The-TARDIS… well, sort of, as Missy glibly assumes the role of “Doctor Who”, along with Bill and Nardole acting as her trusty “disposables” while the Doctor observes from inside the TARDIS. However, when the blue-skinned humaniod Jorj arrives and holds them at gunpoint the Doctor soon has to intervene. The ship is on full reverse, but because of the time dilation caused by the close proximity of the black hole, time is moving at significantly faster rate at the top of the vast colony ship than at the bottom. Fearing the beings about to arrive in the lift, Jorj shoots Bill when she admits to being human, fatally wounding her. Sinister humanoids dressed in hospital gowns then emerge from the lift and take Bill’s body away despite the Doctor’s protestations. It is from this shocking moment, as we linger for what seems an eternity on the gaping wound in Bill’s chest, that World Enough and Time spirals momentarily into flashback mode to bring us up to speed with the events that have brought us to this point. There are some wonderful scenes as the Doctor and Bill discuss his long-standing friendship with Missy / the Master, its all beautifully played by Capaldi and Mackie, and it makes what is to come feel all the more heartbreaking as a result. 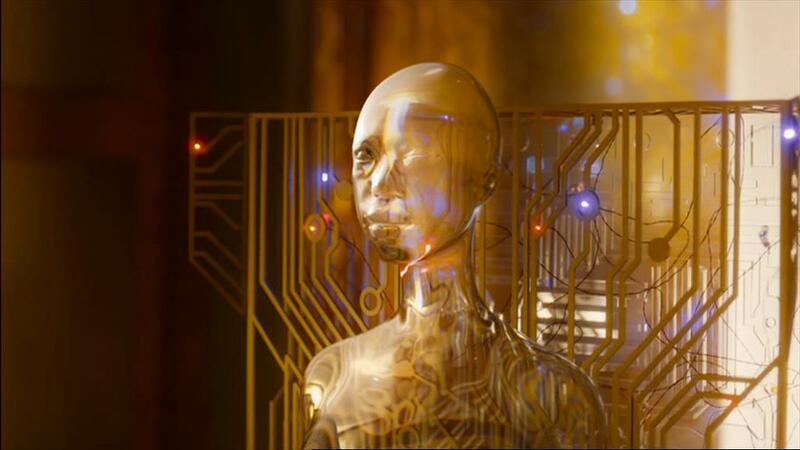 With the Doctor’s telepathic message instructing her to wait for him haunting her from this moment on, Bill awakes in a strange hospital to find a mechanical device has been grafted to her chest – effectively replacing her heart. Befriended by one of the hospital workers, Mr Razor, Bill gradually settles into life at this end of the colony ship as the population prepares to be upgraded for Operation Exodus, meanwhile the Doctor begins to piece together what really happened to the bridge crew, and the implications of the time dilation for the Doctor and Bill quickly become frighteningly apparent as we observe events seemingly conspiring to keep them apart. Soon, the TARDIS trio are thrown into total chaos, dark secretes and treachery will strike, there are patients crying out quite literally in “Pain” in a creepy hospital, and old enemies are gathering against the Doctor. Peter Capaldi is, as you’d expect, is on magnificent form throughout as the Doctor tackles the rapidly evolving plight they now face. 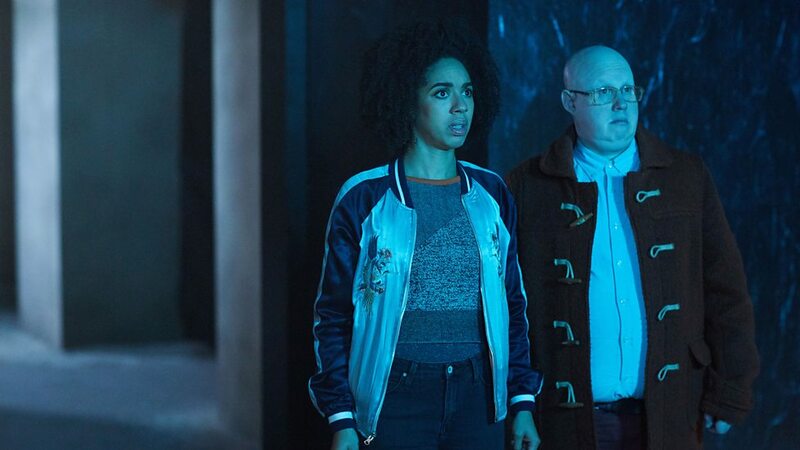 Pearl Mackie also gives a wonderfully emotive performance in this episode as Bill faces some chilling horrors in the hospital, and Matt Lucas continues to impress as Nardole. The guest cast also includes a good performance by Oliver Lansley as Jori, along with Paul Bright well (Surgeon), and Alison Lintott (Nurse). Michelle Gomez is quite simply fabulous in World Enough and Time as Missy, the female incarnation of the Doctor’s arch nemesis, The Master. The subplot concerning Missy’s incarceration in the Vault, along with her subsequent desire to renounce evil and make up for her wicked ways, finally delivers the ultimate payoff in this episode as we get to see just what the self-confessed Queen of Evil is really capable of. 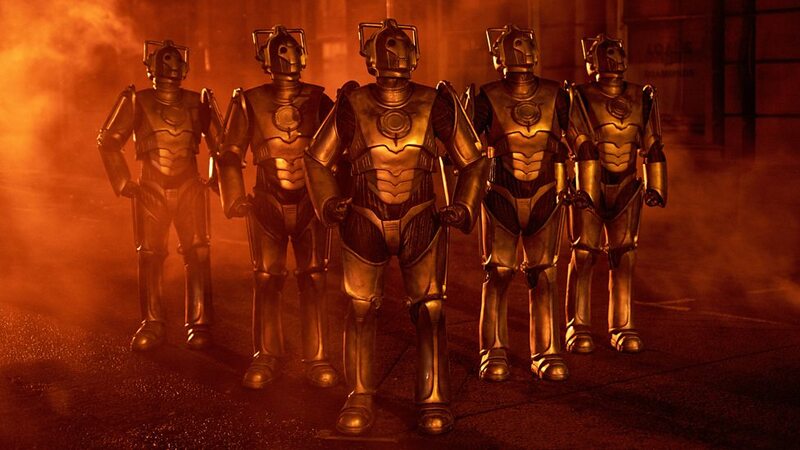 The Mondasian Cybermen first appeared in the 1966 story The Tenth Planet, staring William Hartnell as the 1st Doctor, it was written by Kit Pedler and Gerry Davis, and directed by Derek Martinus. 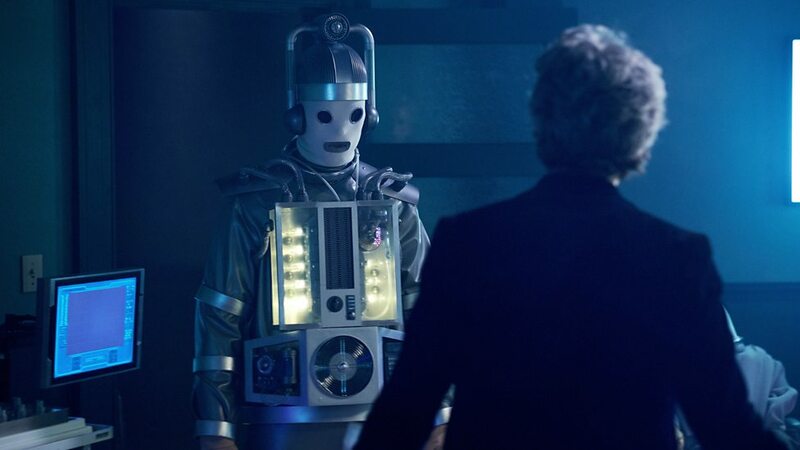 Although for much of World Enough and Time we are actually only presented with their frightening intermediate stage, as seen en mass in the spaceships vast hospital wards, when an original Mondasian Cybermen does finally emerge from the shadows to face the 12th Doctor and Nardole in this episode the splicing of fan-expectation and nostalgia it generates is stunning. Once the lift brining Doctor, Missy, and Nardole eventually arrives at the bottom level of the ship, the Doctor and Nardole head off to find Bill while Missy is entrusted with finding out about the origins of the colony ship – which she soon discovers is from an Earth-like world; Mondas! Approached by Mr Razor, Missy is shocked when he peels away his disguise and is revealed to be her own previous incarnation – The Master! Yes, its not just the Mondasian Cybermen who are back, John Simm also returns in World Enough and Time as the earlier version of The Master, last seen in the 10th Doctor’s 2010 swansong, The End of Time Part 2, and his brief presence really brings an electrifying sense of frisson and drama to this episode as events gradually begin to spiral out of control for the Doctor. 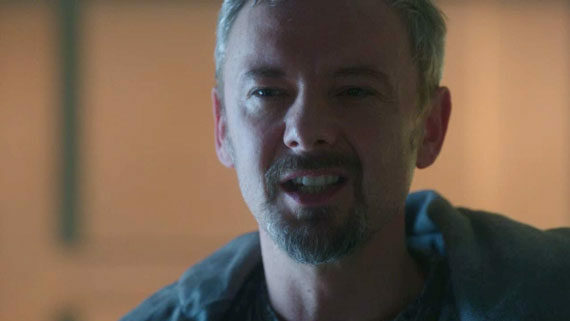 Sporting greyer hair and a neatly trimmed goatee, John Simm ensures his portrayal of the Master is just as villainously evil and menacing as ever, and the scene stealing moment where the Master and Missy unite against the Doctor is brilliantly played by Simm and Gomez, and its made all the more shattering once the Doctor realizes the Mondasian Cyberman he’s found is Bill when it tells him that it waited for him. This has to be one of Doctor Who’s most powerful cliff-hangers ever. 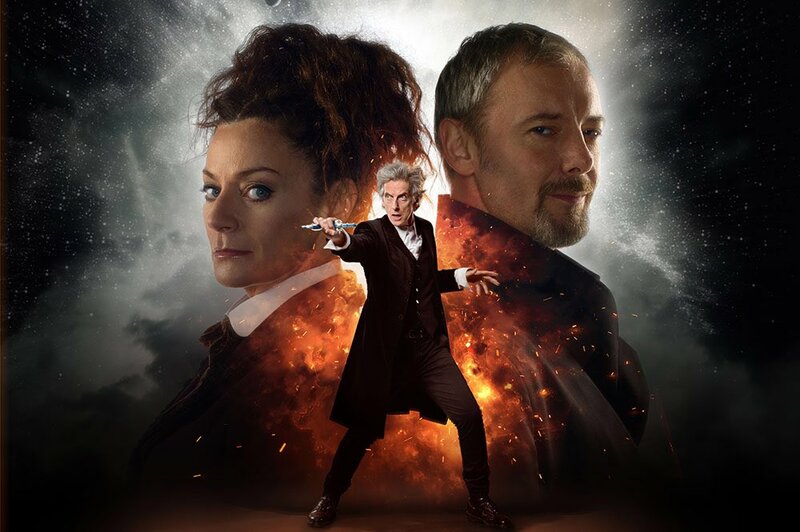 However, it is a great shame that John Simm’s return as the Master wasn’t kept secret though, as the build up to this big event is really good and it would’ve made one hell of a surprise when coupled with the horror of Bill‘s tragic fate. While not as loaded with Cybermen references as I might’ve expected, World Enough and Time does hint to some other key points from the programmes past. Missy’s insistence on calling herself “Doctor Who” during her fleeting role as the Doctor in this episode is an interesting word-play on the Doctor’s actual name, which often tends to be used in this manner more like a question, like in The War Machines (1966) when WOTAN, the computer in the Post Office Tower, demanded: “Doctor Who is required.” John Simm is back as the Master, as is the renegade Time Lord’s penchant for disguises, something Roger Delgado’s Master often employed in his schemes following his debut in Terror of the Autons (1971) to outwit UNIT and the 3rd Doctor (Jon Pertwee), most memorable of which was probably adopting the identity of Reverend Mr Magister in The Daemons. When the Master returned in the 80’s played by Anthony Ainley other disguises included the elderly Portreeve in 1981’s Castrovalva and the wizard-like Kalid in Time Flight, and in 2007’s The Sound of Drums and Last of the Time Lords the John Simm incarnation of The Master took on the persona of the newly elected Prime Minister – Harold Saxon. In another clear link back to the 3rd Doctor’s era Peter Capaldi’s Doctor also uses some Venusian Aikido in World Enough and Time to deal with Jorj. 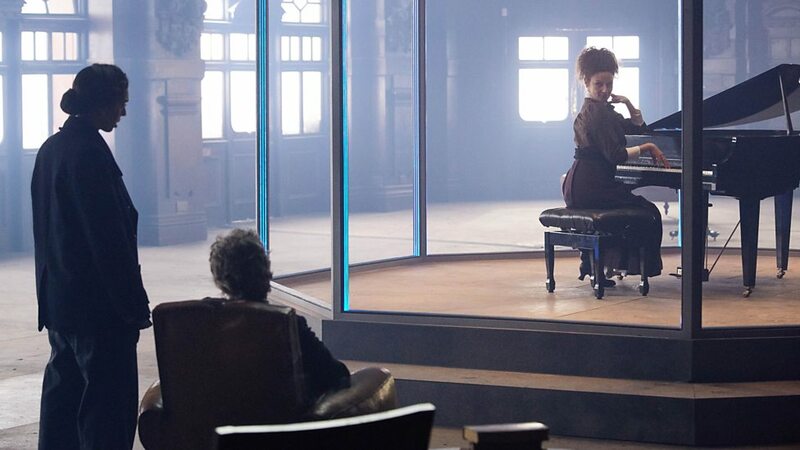 Even though Missy and Bill take centre stage over the Doctor for a time, Peter Capaldi still gets some incredibly dramatic scenes, there are some timey-wimey shenanigans as well, but Moffat doesn’t trowel it on so thick that it overloads the plot, and of course the return of Jon Simm as the Master is the icing on the cake in this brooding horror-tinged episode. 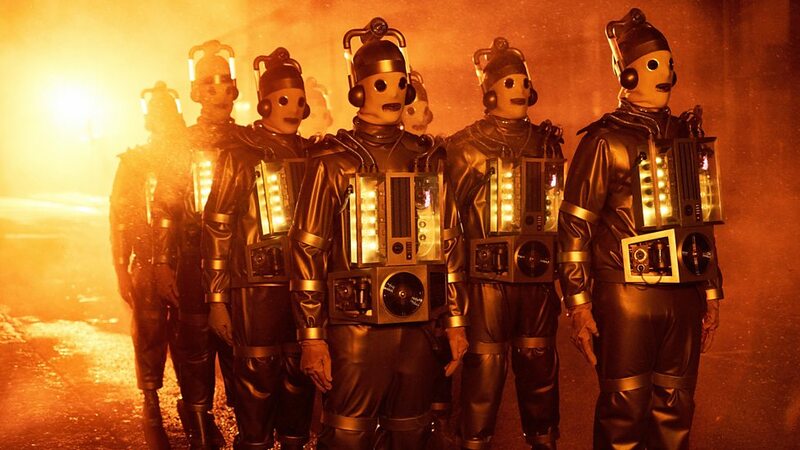 Impressive in scope and atmospherically directed by Rachel Talalay, the sight of Bill fully converted into a Mondasian Cybermen and flanked by Missy and the Master as they confront the Doctor, is as gut wrenchingly emotional as it is exciting, and Moffat and Talalay prove once again what a winning team they make in World Enough and Time when is comes to these two-part extravaganzas. With its opening hints towards the 12th Doctor impending regeneration and its Genesis of the Cybermen premise, World Enough and Time is one of the darkest and most sinister episodes of this series, and the thrilling cliff-hanger masterfully sets everything up for what promises to be a truly epic series finale! It is an enduring mystery, the Roman legion of the ninth vanished in the swirling mists of Scotland long ago in the past. Bill has an uncanny theory about what might’ve happened, and seeing how the Doctor just happens to have a time machine… But once the TARDIS has materialised in ancient Aberdeenshire they soon discover something mush deadlier than a Roman army, because in a secluded cairn there is a doorway, one that leads to the end of the world! The tenth episode of series ten, The Eaters of Light, is perhaps one of the most eagerly anticipated episode this season, as it is written by Rona Monro, who returns to the series nearly thirty years after her first script for Doctor Who – the highly-regarded 1989 Seventh Doctor adventure Survival. The episode is directed by Charles Palmer, who, along with helming the series ten episode Oxygen., also directed 2007’s Smith and Jones, The Shakespeare Code and the acclaimed two-parter Human Nature / The Family of Blood. 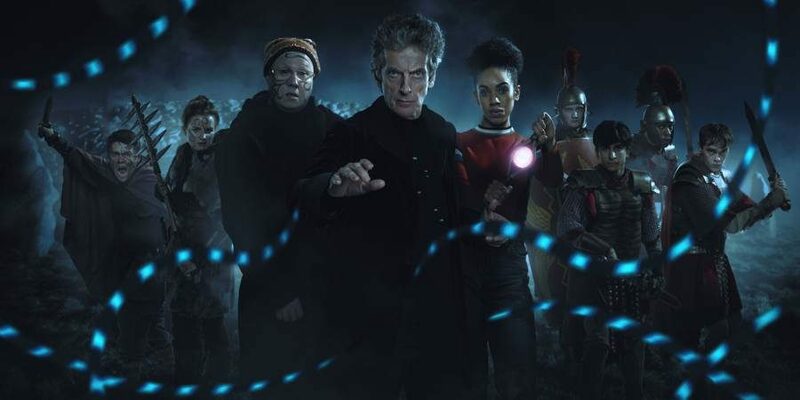 Nardole isn‘t too pleased the Time Lord is off neglecting his oath to guard the Vault again; but he still goes along with Bill and the Doctor to investigate the bizarre mystery surrounding what really happened to Rome’s Ninth Legion who disappeared back in second-century Caledonia in AD120. In this hauntingly evocative episode strange music comes from the earth, the crows are talking, there’s a light-eating monster prowling the night, a Police Box has been carved in a standing stone, and a strange inter-dimensional gateway awaits as the TARDIS trio joins forces with Roman Centurions and Pictish warriors against a terrifying horror like something from Celtic myth that now haunts the lands. Since she wrote Survival, the last story aired in the class series’ original twenty-six year run, Rona Munro has gone on to become one of the UK’s most renowned playwrights, writing also for radio, TV, and film screenplays. Munro’s wonderful script for The Eaters of Light weaves a magical thread of history, fantasy and sci-fi through this spooky saga of ancient legend, lost youth, and the fate of the Ninth Legion. As well as being a life-long fan of Doctor Who, Rona Munro now also has the added distinction, so far, of being the only person to have currently written stories for both the TV’s Doctor Who’s twentieth and twenty first century versions of the programme. Peter Capaldi gives an especially towering performance as the Doctor in this episode, being both wise and heroic to a fault. Meanwhile, Bill finds this motley and diverse bunch of Roman’s are far more open-minded than she could’ve expected, especially where topics of sexuality are concerned, and Pearl Mackie one again brings a delightful sense of wonder and charm to the role of Bill Potts. Matt Lucas of course gets most the fun lines as Nardole, whose wry observations bring a welcome dash of mirth to the narrative. 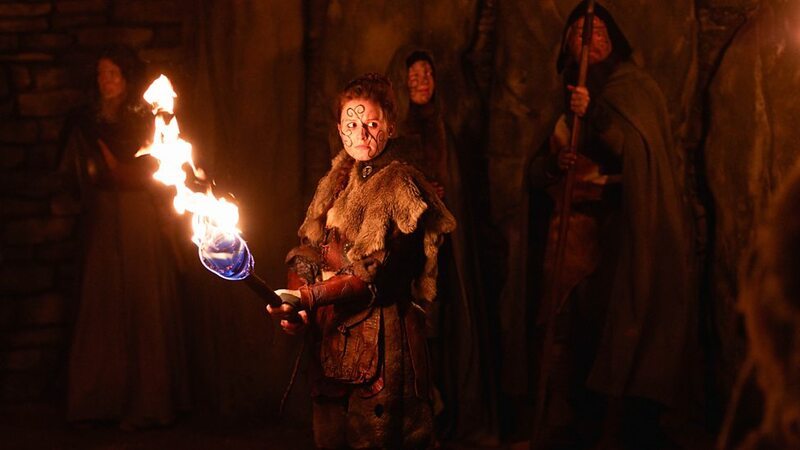 The Eaters of Light also features a great supporting cast: including Rebecca Benson (Kar), Daniel Kerr (Ban), Juwon Adedokun (Simon), Brian Vernel (Lucius), Ben Hunter (Thracius)), Arron Phagura (Marcus), Sam Adewunmi (Vitus), Billy Matthews (Cornelius), Jocelyn Brassington (Judy), and Lewis McGowan (Brother). After discovering most of the Ninth Legion has been slaughtered by a “beast” known as the Eater of Light, Bill finds sanctuary with some of the surviving Roman soldiers. 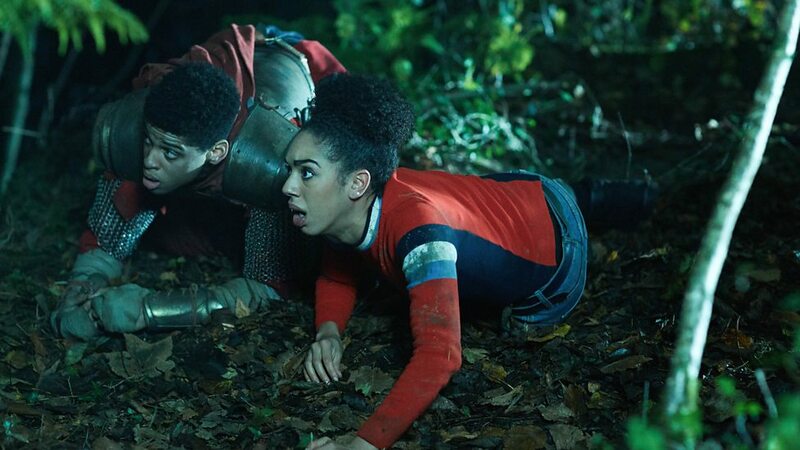 Meanwhile the Doctor and Nardole have found the remaining Pict warriors, the sole defenders against the Eaters of Light, whose weapons can refract and poison the light the monsters feed on. Their cairn holds the portal – where time flows more slowly – to the beast’s realm. Once in every generation, a lone warrior must enter to protect the gateway from an invading creature. Though they would survive only a few hours, it would be long enough to protect the world, but the Picts never suspected that each beast they battled was just the first of a deadly swarm that lurks beyond the portal. It perhaps comes as no surprise that, much like The Empress of Mars which preceded it, The Eaters of Light also has a distinctly classic series feel about it. Charles Palmer’s excellent direction really makes the most of the impressive scenery. The episode is a bit low action in some places, but there is some great characterization, and the dark and atmospheric setting more than compensates for any lull in the overall pace of the story. This is an episode that once again has the Doctor and Bill separated for part of the story, so we get the Time Lord and Nardole teamed up for a bit, and the banter between them proves quite fun at times. The Ninth Legion did really exist and they did disappear mysteriously. The Easters of Light is far from the first story in the programmes history to focus on such unexplained events. Real life mysteries have often provided the basis for many Doctor Who stories over the years: such as the inexplicable sightings of the Loch Ness Monster in Terror of the Zygons (1975), the extinction of the dinosaurs in Earthshock (1982), and Agatha Christie’s famous disappearance in The Unicorn and the Wasp (2008), are just a few examples where fact, mystery, and Doctor Who’s timey-wimey fictional world have collided with spectacular results. In the Easter of Light the Doctor’s companion Nardole also refers to the mystery of the Mary Celeste as he chats to the Picts when the Time Lord is absent for two days because of the time distortion while he’s investigating the portal. The abandoned Mary Celeste was found in the Atlantic Ocean in 1872, an enduring enigma, it has never been solved, but the 1st Doctor (William Hartnell) adventure The Chase (1965) had the Daleks appearing briefly on board the Mary Celeste which then frightened the crew into abandoning ship! I really liked how the way the TARDIS can translate languages is woven into the story in The Eaters of Light. First discussed in The Masque of Mandragora (1976), when the 4th Doctor (Tom Baker) explained to Sarah Jane Smith (Elisabeth Sladen) how it is a ‘Time Lord gift’ that allows them to understand and interpret local languages. 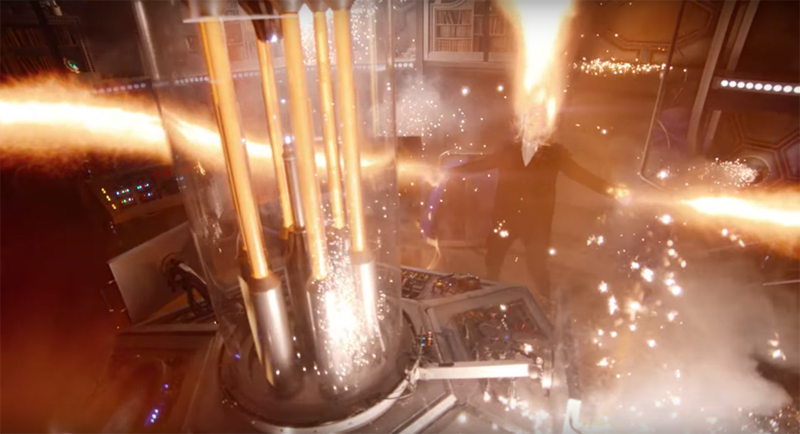 In the modern series its also become something linked to the TARDIS as well – which Bill quickly deduces in The Eaters of Light. It’s a moment that’s pivotal in getting the Roman and Pict survivors to put aside their differences and work together to fight the beast. Following the Doctor’s guidance, they mange to trap the beast at the gateway during daylight. Someone must stay and stop the monsters escaping until sunset. Because of the portals time dilation the Doctor believes only his Time Lord Physiology will enable him to complete the task, but the Kar and the last of the Ninth Legion overrule him and enter the gateway together to finally end this ancient battle and prevent humanity from being cast into darkness forever. The Doctor offers no definitive explanation for the origins of the Eaters of Light; we get some idea of how these light-eating locusts can breach the dimensional cracks between worlds to feast on light. For the most part, the eponymous “beast” of the story only appears fleetingly. Every hour of sunlight that feeds the monster makes the world darker by the moment. Striking from the shadows, the way it drains the light from its victims and hunts the humans is, initially at least, really effective. Sadly, when the monster finally appears in its entirety for the climatic final battle in the cairn, the CGI rendered creature isn’t that satisfying, which is rather disappointing considering all the effort that’s been put into establishing its threat to the world. As the Doctor, Bill, and Nardole depart in the TARDIS leaving the remaining Picts to honour Kar’s memory, The Eater of Light has a wonderful coda featuring Michelle Gomez as the ever repentant Time Lady, Missy. It transpires she’s been on board during this adventure the whole time at the Doctor’s behest, doing maintenance on the TARDIS, and also observing their adventure – much to Nardole’s and Bill’s chagrin. 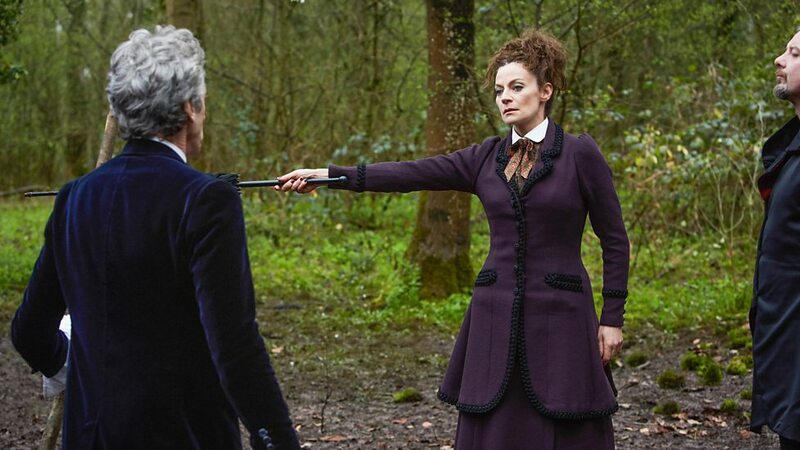 We even get to briefly explore the complex nature of the Doctor’s relationship with Missy / the Master in an especially moving moment; and the dramatic tension Peter Capaldi and Michelle Gomez create here in this short scene is mesmerising. Slightly ropey CGI monster effects aside, The Easters of Light is still an extremely good episode. 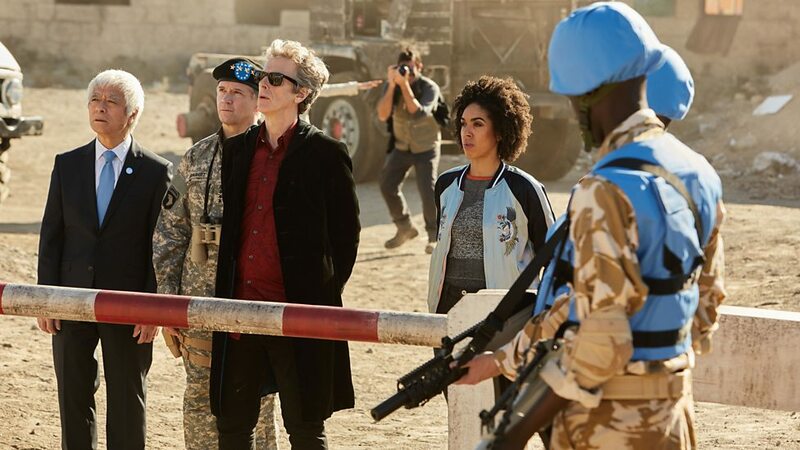 Rona Munro’s script is bursting with pertinent themes and strong characterization for this final standalone episode of series ten, Capaldi, Mackie, and Lucas are all at the height of their game, and it’s all impressively directed by Charles Palmer. Now the stage is set first part of the big series finale World Enough and Time, and with the incredible ‘next time’ trailer also offering a glimpse of John Simm as the Master, and the original Mondasian Cybermen, I can’t wait to see what happens next! Doctor Who Series 10 New Iconic image featuring Missy & The Master! for the Season 10 Finale! 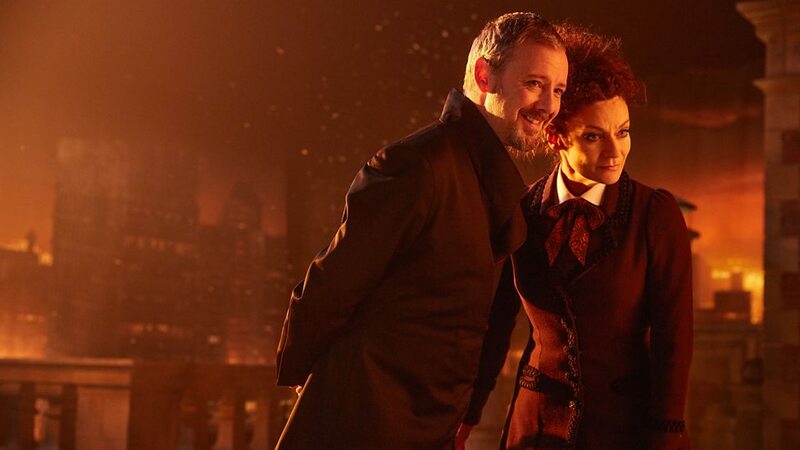 A new image has just been released for the Doctor Who series 10 finale, featuring Missy (Michelle Gomez) and the Master (John Simm) together for the first time. 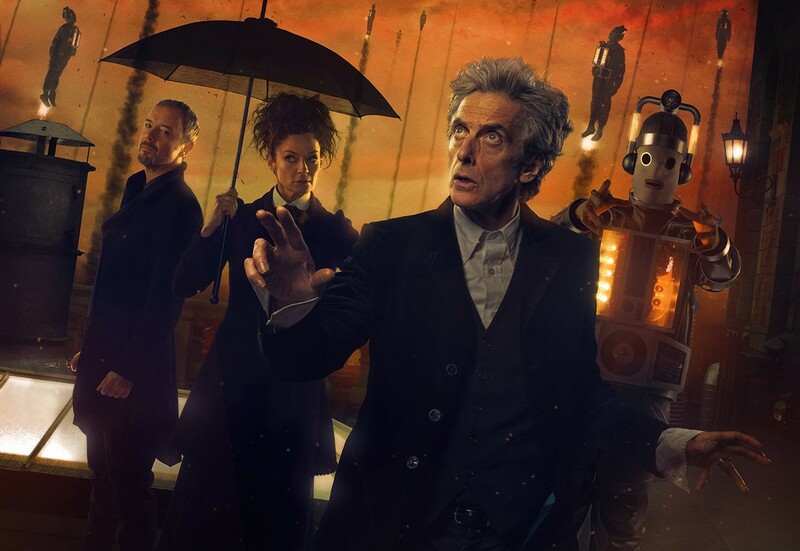 The pair are seen either side of the Doctor (Peter Capaldi) as they put their own chilling spin on the iconic poster image that previously accompanied Doctor Who’s 50th anniversary special, The Day of the Doctor. Simm is returning to Doctor Who as the Master for the first time since New Year’s Day 2010, when he was instrumental in brining about the Tenth Doctor‘s regeneration. 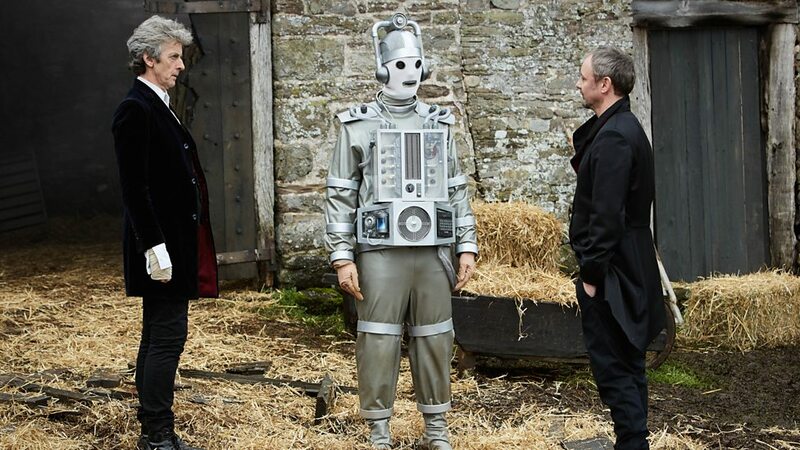 Now the Master will come face-to-face with Missy, his own later regeneration, and battle the Doctor in the series’ two part finale which begins next weekend.The episodes also feature the return of the Cybermen – including the original Mondasian Cybermen, for the first time in over 50 years. 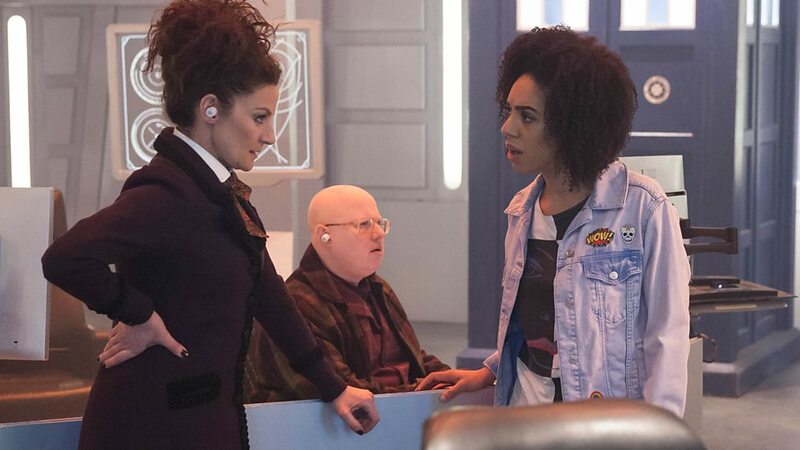 Peter Capaldi’s 12th Doctor is accompanied by Bill Potts (Pearl Mackie) and Nardole (Matt Lucas) in an epic story that will change Doctor Who forever! 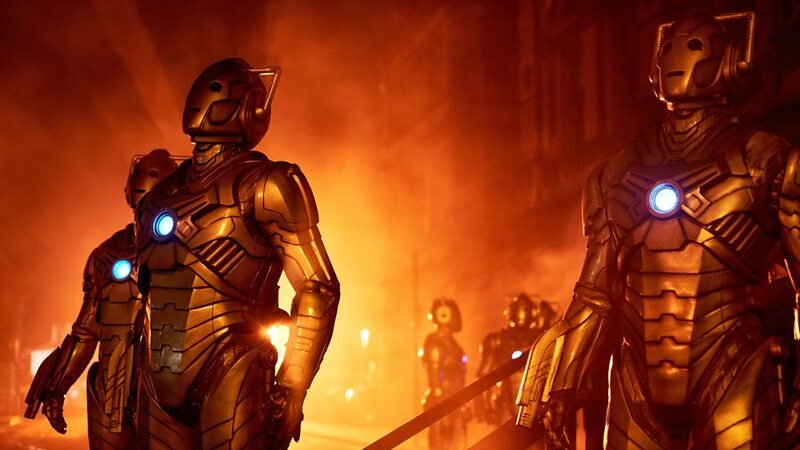 Doctor Who’s series finale begins with episode 11, World Enough and Time, at 6:45pm on Saturday 24 June on BBC One. 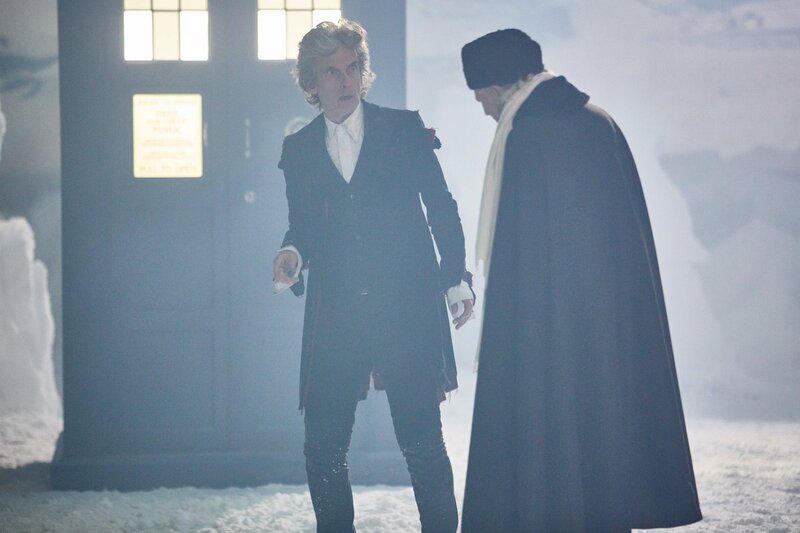 It concludes on Saturday 1 July with episode 12, The Doctor Falls – an extended, 60 minute episode. 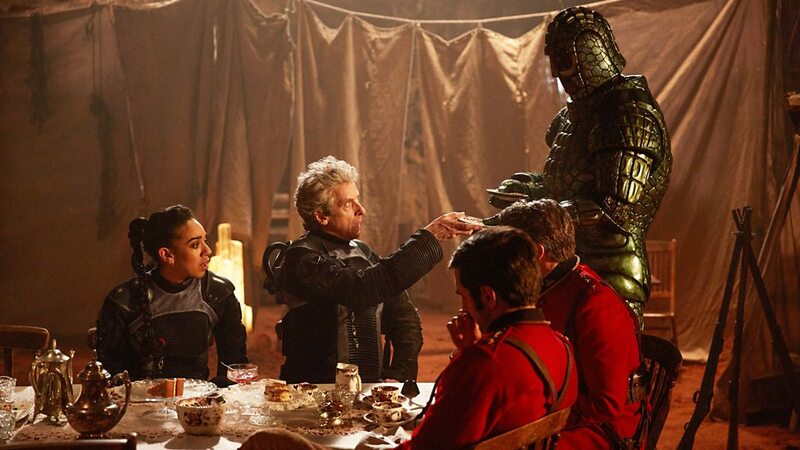 Not all is quite as it sss sseeems when the TARDIS arrives on Mars and the Doctor, Bill, and Nardole gets caught up in the middle of an uncanny conflict between Ice Warriors and Victorian soldiers! It appears that the Earth has somehow invaded Mars. As the Martian forces in the hive awakens, their Ice Queen Iraxxa prepares to lead them to war. Now the Doctor faces an impossible choice. It is the humans, and not the Ice Warriors that are the aggressors this time around, so which side will the Time Lord choose to be on? The Empress of Mars is written by Mark Gatiss, the writer of several Doctor Who episodes: including The Unquiet Dead (2005), The Idiot’s Lantern (2006), Victory of the Daleks (2010), two episode from 2013’s seventh season, Cold War and The Crimson Horror, along with Robot of Sherwood (2014) from series eight, and 2015‘s Sleep No More. Now, with The Empress of Mars, Mark Gatiss makes a welcome return for series ten with a story which also features the classic Doctor Who monsters – The Ice Warriors! Stylishly directed by Wayne Yip (The Lie of the Land), The Empress of Mars sees the Doctor Peter Capaldi), Bill (Pearl Mackie), and Nardole (Matt Lucas) gate crash NASA as the Mars probe Valkyrie relays an image from the red planet showing the words “God Save The Queen” etched on the barren Martian surface beneath the polar ice cap. 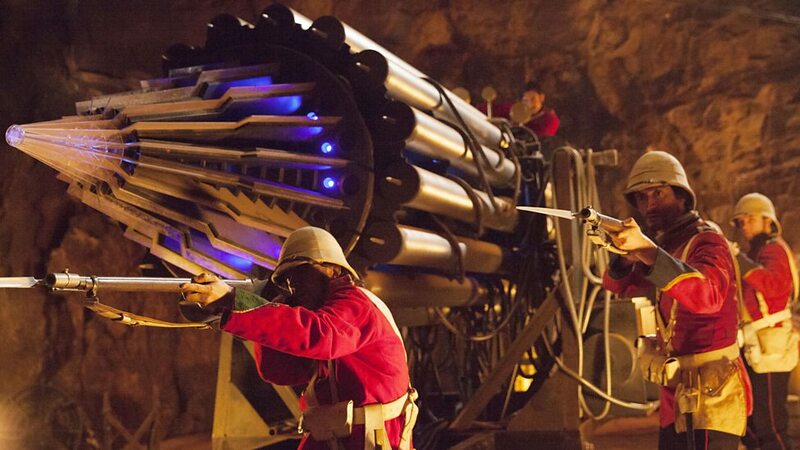 Taking the TARDIS to Mars, in 1881 to investigate, the Doctor and Nardole become separated from Bill when she falls down an underground shaft, but when Nardole returns to the TARDIS to fetch rope the time machine inexplicably dematerialises with him inside. Marooned on Mars, the Doctor and Bill soon discover a group of Victorian soldiers Goodsacre (Anthony Calf), Catchlove (Ferdinand Kingsley), Seargant Major Peach (Glenn Speers), Jackdaw (Ian Beattle), Vincey (Bayo Gbadamosi) and Coolidge), who, along with their servile Ice Warrior survivor Friday (Richard Ashton), are busy excavating on the desolate red planet. The Ice Warrior “Friday” was so named by the soldiers who found him and his crashed spaceship the middle of the South African veldt on 19th century Earth because he reminded Colonel Godsacre and Captain Catchlove of Man Friday in Robinson Crusoe. Friday is really a lone guardian, appointed after a brutal civil war when his Ice Queen ordered her warriors into hibernation, he was to guard the Ice Warriors hive and reawaken them when it was safe to rebuild their world. But disaster struck and his ship crashed on Earth instead. Feigning submission and grief at his species apparent demise, Friday promised the soldiers the riches of his homeworld if they helped him return to Mars, and tricked them into using technology from his ship to mine the plant. But when “The Gargantua” cannon breaches the Ice Queen’s Tomb it doesn’t take long before Empress Iraxxa (Adele Lynch).is revived and a disastrous initial meeting with the soldiers causes her to awaken the dormant army of Ice Warriors for battle, and the soon Doctor is faced with the daunting prospect of mediating between the invading Victorian Soldiers and the reptilian Martian warriors as conflict erupts. Mark Gatiss’ love of the Ice Warriors shines through every aspect of his script for The Empress of Mars. 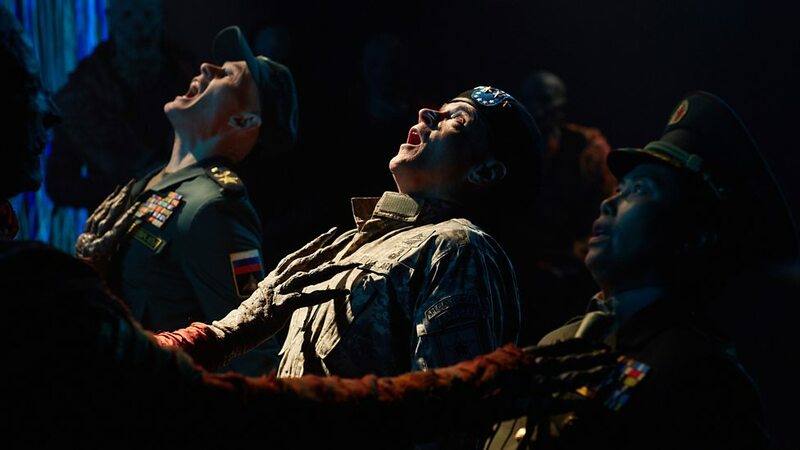 Along with subtle nods to the creatures past, Gatiss continues to explore new facets of their society and culture – though perhaps not quite as successfully he did in Cold War. 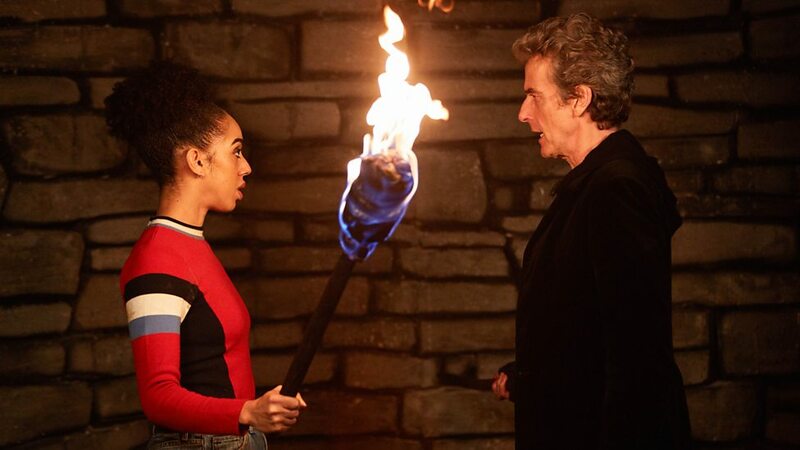 Peter Capaldi and Pearl Mackie, once again shine in their respective roles, this is a comparatively Nardole-lite episode for Matt Lucas though, but he still plays one particularly significant role in the plot when the TARDIS starts “playing up” and prevents him returning to Mars. 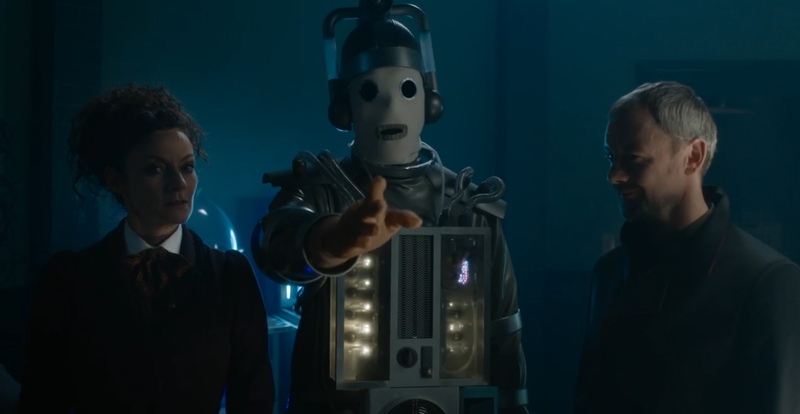 Nevertheless, the regular’s performances complement each other perfectly, and this TARDIS trio is now rapidly becoming one of my all time favourites. The majority of the supporting cast of characters that make up the Victorian soldiers are also good, if a little clichéd, however it is their duplicitously subservient Ice Warrior, Friday, played by Richard Ashton that really stands out – especially in the scenes with the Doctor and Bill. 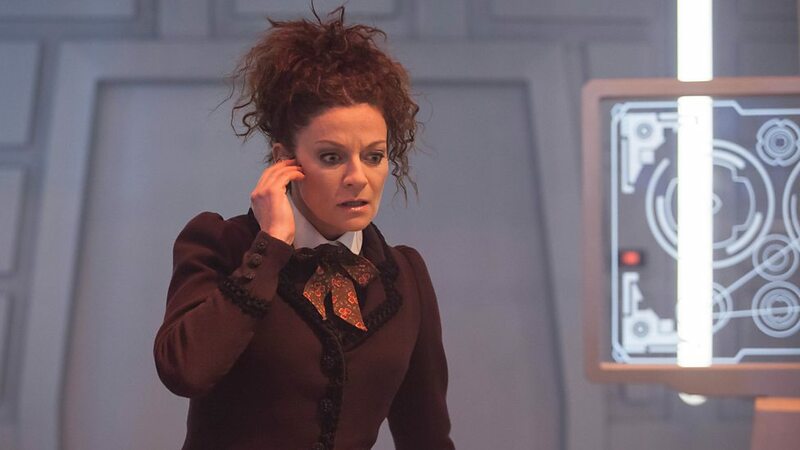 Michelle Gomez also briefly returns in this episode as Missy, the Doctor’s arch Time Lady nemesis and Queen of Evil, when Nardole seeks her help in piloting the TARDIS back to Mars. Having been confined in the Vault she now apparently seeks redemption for her crimes against the universe, Missy’s actions in The Empress of Mars would seem to offer some validity to her new moral stance, and once again Michelle Gomez’s brilliant understated performance proves as utterly compelling as ever. The Ice Warriors are amongst the classic pantheon of Doctor Who monsters. Ever since the Second Doctor (Patrick Troughton) originally encountered them in The Ice Warriors (1967) and The Seeds of Death (1969), they went on to return in the Third Doctor (Jon Pertwee) stories The Curse of Peladon (1972) and The Monster of Peladon (1974), The Waters of Mars (2009) implied the Ice Warriors had discovered a horrifying force beneath the surface of the Red Planet, and the 11th Doctor (Matt Smith) was confronted by Grand Marshal Skaldac when the redesigned Ice Warriors made a triumphant return in Cold War (2013). It’s astonishing to think that in the fifty years since their debut story, we’ve never actually seen the Ice Warriors on their homeworld. Now at last The Empress of Mars finally shows us the Ice Warriors on Mars. Although initially a little bit of a slow burn to begin with, the episode soon kicks into high gear once the Ice Warriors awaken en mass, and they also utilize new and rather gruesome way of killing. Of course, aside from the impressive regular Ice Warriors, there’s also a notable addition to legacy of the Ice Warriors, and indeed the series’ mythology overall, in The Empress of Mars, in that it features the first appearance in the programmes history of the species female Queen, the Empress Iraxxa, played by Adele Lynch. Iraxxa provides a whole new dimension to these classic monsters, and Lynch’s performance is quite good – if a little bit over-the-top at times. Pearl Mackie also continues to impress and show great versatility as Bill really steps up as the Doctor’s companion in this episode, getting some fantastic scenes and verbal exchanges with Empress Iraxxa. In a fleeting, glimpse-and-you’ll-miss-it moment, we see a portrait of Queen Victoria in the soldier’s underground camp on Mars – or at least the version of her played by Pauline Collins in the 2006 episode Tooth and Claw. 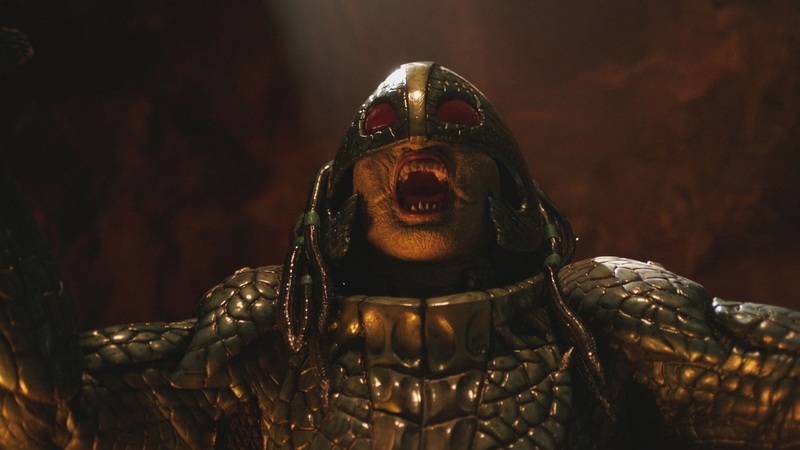 Unsurprisingly for the return of the Ice Warriors in The Empress of Mars, Mark Gatiss has pepped his script with fun references to the classic series, but there is one surprise guest appearance few could’ve expected – the return of Alpha Centauri! Yes, it may only be for a short greeting on a screen, but the wonderful addition of Alpha Centauri – a friend of the Doctor’s and ambassador of the Galactic Federation who originally appeared in the previous classic series Ice Warrior stories The Curse of Peladon (1972) and The Monster of Peladon (1974) which starred Jon Pertwee as the 3rd Doctor – is a great callback to the classic series that many fans are sure to adore. Its something made all the more special as well because Alpha Centauri’s original voice actor Yasanne Chruchman also returns to deliver the characters dialogue for this scene. 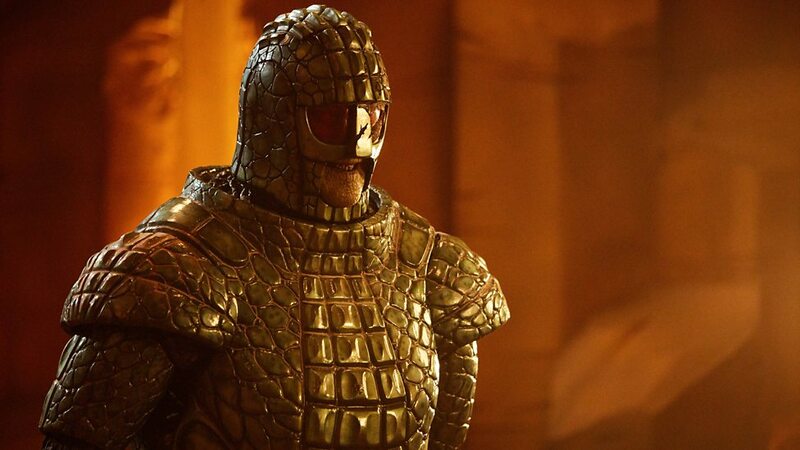 The Ice Warriors return in The Empress of Mars is without doubt one of the most fan-pleasing moments of series ten so far, so its perhaps no surprise that it also feels like a very old school classic Doctor Who story in many respects. The madcap premise of this bizarre sci-fi mashup of Journey to the Centre of the Earth and Zulu, along with a good pinch of Steampunk thrown in for good measure, makes for a highly atmospheric and entertaining episode. The drama builds from the moment Iraxxa’s sarcophagus is discovered, and the subsequent clash between the Victorian Soldiers and the Ice Warriors presents an extremely interesting dilemma for the Doctor. Most of the action takes place underground, but there are some nice establishing shots on the surface of Mars, the scene where the hive is activated are superb, and later the way the Ice Warriors emerge from the ground to attack is also very effective. With its great opening set-up, strong performances from Capaldi, Mackie, Lucas, along with the surprise addition of Michelle Gomez as Missy, and of course Alpha Centauri’s special guest appearance, this episode is a fantastic return for the Ice Warriors. 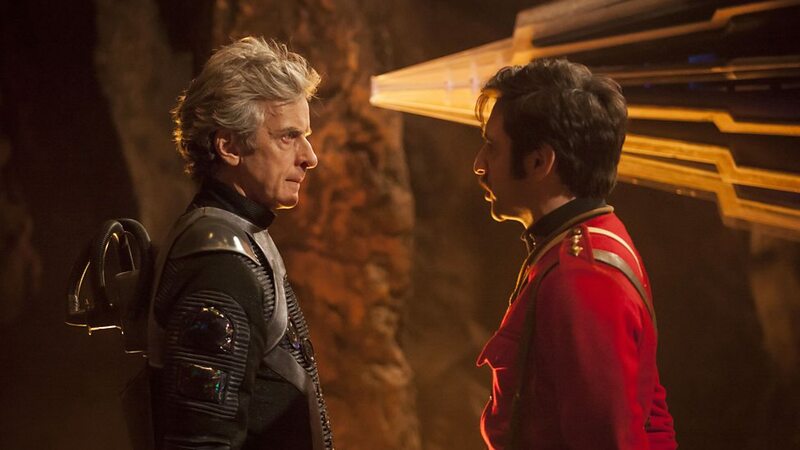 Sure, Mark Gatiss’ script is a tad self-indulgent at times, but ultimately The Empress of Mars is still one of the major highlights of series ten! Check out the Next Time trailer for The Eaters of Light. The entire world is in thrall to a collective delusion and only Bill Potts’ can see through this mass lie to the truth. With even the Doctor choosing the wrong side, it falls to Bill to persuade the Time Lord that the whole human race is in danger, because if she can’t convince the Doctor, Bill might have to kill her best friend to save humanity. The eighth episode of series ten, The Lie of the Land, marks the Doctor Who debut of Director Wayne Yip, his previous credits include Secret Diary of a Callgirl, Utopia and Misfits, as well as episodes 6 & 7 of the BBC Three Doctor Who spin-off series Class. The Lie of the Land is written by Toby Whitehouse, his seventh script for Doctor Who, along with School Reunion (2006), The Vampires of Venice (2010), The God Complex (2011), A Town Called Mercy (2012), and most recently 2015’s Under the Lake / Before the Flood. As the final chapter of the Monk Trilogy, The Lie of the Land presents us with a drastically altered present-day Earth following the aftermath of Bill’s “executive decision” in The Pyramid at the End of the World. Earth has been invaded by the Monks, history has been rewritten, and the Doctor is now seemingly on their side – as the Time Lord’s constant broadcasts of fake news would seem to attest. Unbelievers who do not accept the Monks as their world’s benefactors are imprisoned. However, the Monks have been on Earth for only six months, not millions of years as they’ve led humanity to believe. 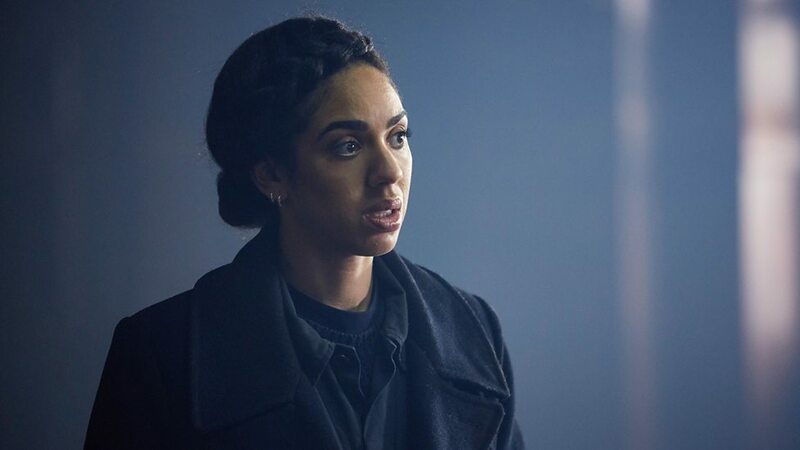 Only Bill can see through the global deception, with Nardole’s help – now recovered after his exposure to the chemical biohazard at Agrofuel Research Operations – she must rally the resistance against the Monks regime, but when Missy’s knowledge of the Monks is needed to help the Doctor, Bill, and Nardole to save the world their mission soon becomes even more dangerous. Toby Whitehouse’s intense script plunges the world into a warped dystopian nightmare unlike anything we’ve quite seen before. From the chilling prologue, the Monks uncompromising rule is frighteningly reinforced by the Doctor’s rather creepy behaviour. Peter Capaldi excels in every scene, brining a dual edge to the role of the Time Lord, and giving arguably one of his strongest performances so far this season. Pearl Mackie also gives a sensitive and engaging performance as Bill Potts, who must now face the harsh agonies of this darkly reinvented world that she’s ultimately responsible for, and at times its affected her so much Bill’s even started to talking to her late mother (played by Rose Jane) to prevent her from loosing her mind. 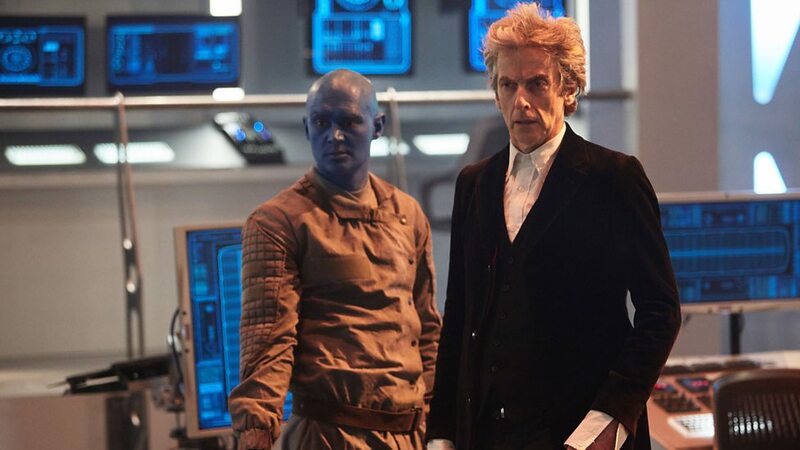 Nardole once more provides some much needed comic relief to dispel the gloom, Matt Lucas gets some great lines, and his characters key role here highlights what an integral part this TARDIS trio he has become. 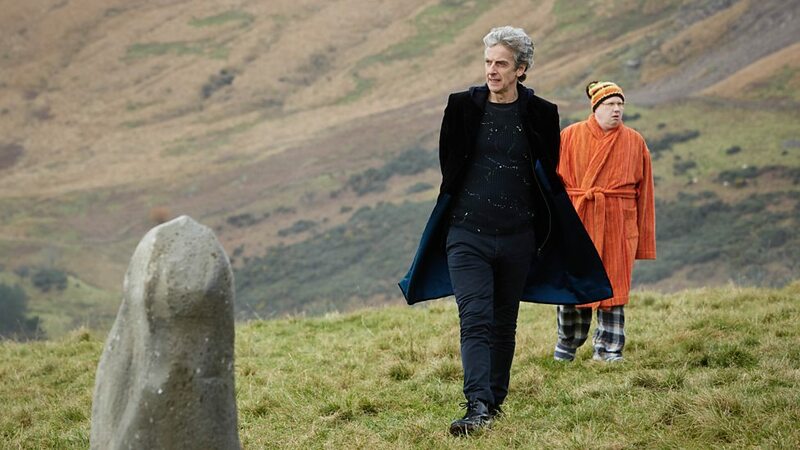 Bill and Nardole finally manage to track the Doctor to a prison ship off the coast of Scotland, but to their horror it seems that he has really swapped sides and joined the Monks. This in turn forces Bill to make one of the most difficult decisions of all, and it’s a truly heart-in-the-mouth moment as Bill steps up to the plate and shoots the Doctor! 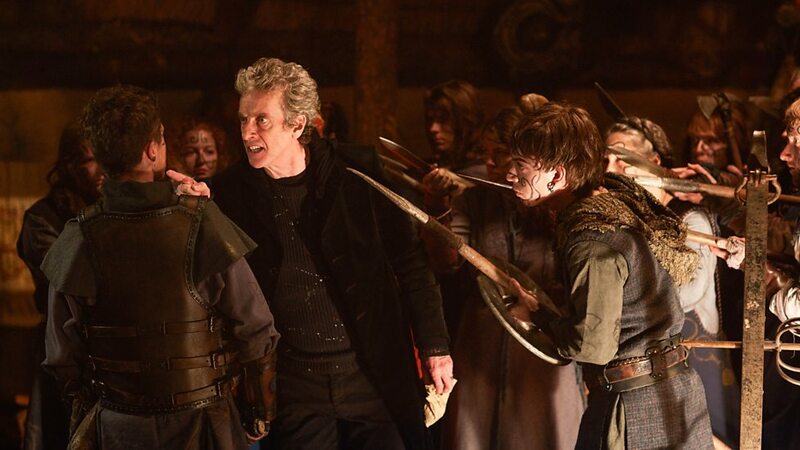 From this shocking turn of events an early regeneration appears to be on the cards, but when the Time Lord’s sudden regeneration quickly stops, it becomes clear the situation on the ship is an elaborate ruse by the Doctor, Nardole, and the soldiers of the resistance to make certain Bill is free of the Monks influence. In order to learn more about the Monks though, the Doctor and Bill must return to the university to seek help from a certain Time Lady who knows a thing or two about how the Monks manage to subjugate entire worlds. Michelle Gomez returns in The Lie of the Land as Missy, the female incarnation of the Doctor’s arc nemesis; The Master. This episode finally takes us inside the Vault where Missy has been incarcerated. It would appear Missy is going “cold turkey” from evil, but she still delights in revealing that to break the Monks psychic grip on the world they must find whoever opened the door for the Monks and kill them, which obviously isn’t good news for Bill! Just as in Extremis, Michelle Gomez turns in a slightly subdued performance that completely wrong foots our expectations about Missy. Her appearances bring added gravatis to the episode, together with a moving insight that once again shows her character in a somewhat different light, but has the Queen of Evil really changed her ways or is Missy simply playing her wickedly evocative brand of villainy to a different tune? Having played the Monk in the first two parts of this trilogy, Extremis and The Pyramid at the End of the World, Jamie Hill (The Foretold in 2014’s Mummy on the Orient Express and a Silence in series six) is back, this time as the Giant Monk for The Lie of the Land. 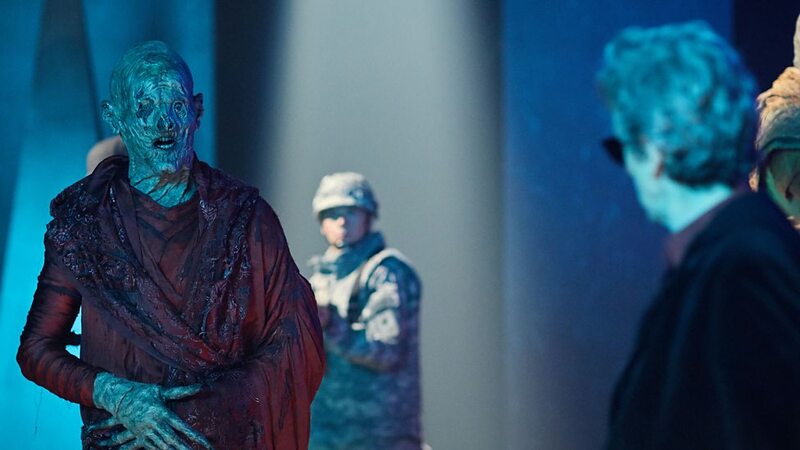 After being given pure consent to take over the world by Bill in the previous episode – to save the Doctor and restore his sight – these cadaverous looking red-robed Monks have shaped the world to suit their own twisted Orwellian designs. Now they are part of the very fabric of humanities development, they’ve guided our history, the technological advances, and even protected us from alien invaders. Although the Monks don’t actually say or do that much in The Lie of the Land, we do see more of their energy powers as they defend the interior of their main pyramid, where the Giant Monk sits overseeing a giant central broadcasting chamber that maintains the psychic mass-delusion. 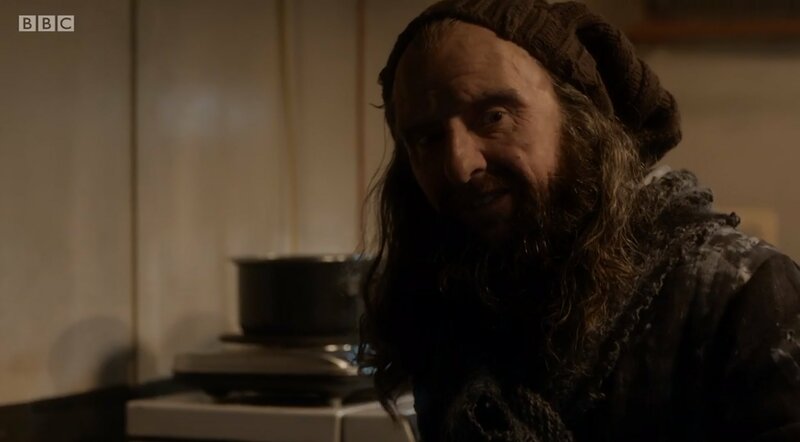 Along with the terrific performances from Peter Capaldi, Pearl, Mackie, Matt Lucas, and Michelle Gomez, The Lie of the Land also features a great supporting cast, featuring Solomon Israel (Richard Curnew), Stewart Right (Alan), Beatrice Curnew (Group Commander), Emma Handy (Mother), Athena Droutis (Girl), Amanda Mealing (Connie), and Tony Marshall (Noel). The Lie of the Land has distinct echoes of The Last of the Time Lords (2007) and Turn Left (2008) about it, both were episode which also depicted the Doctor’s companions (Martha and Donna respectively) taking a more central role in a another stark dystopia version of the world. The Doctor’s opening monologue about the Monks exploits in The Lie of The Land include glimpses of a Dalek from Into The Dalek (2014), a Cybermen in Nightmare In Silver (2013), and a Weeping Angel from Blink (2007), later we see scenes from the Pilot, and in the Monks cathedral we see other still images displayed from the current tenth series. The brand Magpie Electricals – originally introduced in 2006’s The Idiod Lantern – is also quite prominent in this episode. Missy plays some of Erik Satie’s Gnossienne No 1 on the piano and later some of Scot Joplin’s The Entertainer. 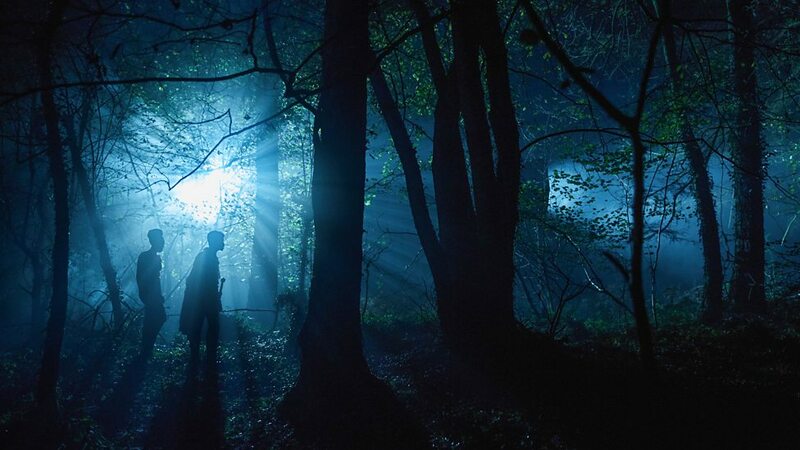 Perhaps most notably, aside from a brief glimpse when Bill mentally battles against the Monks in the cathedral, the TARDIS doesn’t feature at all in The Lie of the Land, not something that often happens in modern Doctor Who – 2008’s Midnight is another fine example of a TARDIS-less episode from the programmes current era. 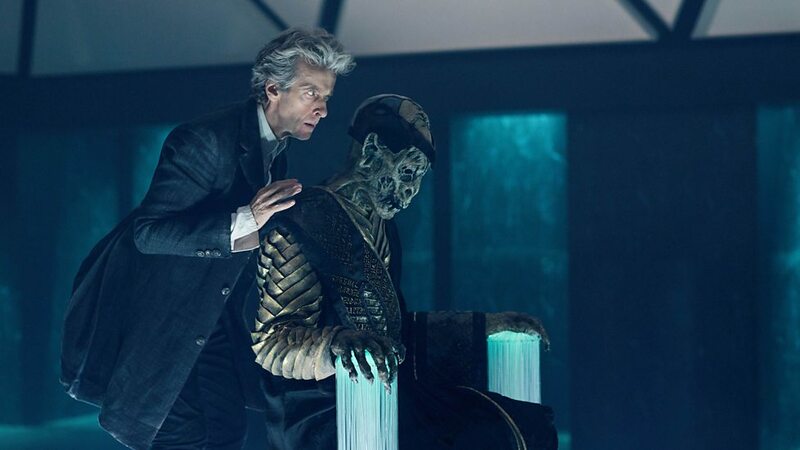 As well as providing us with a great new monster, The Monk trilogy has brought an intriguing change of pace to series ten, and skilfully dispelled any kind of mid-season lull. The leads all give exceptionally powerful central performances that make The Lie of the Land extremely compelling viewing at times. A great set up during the first half of the episode skilfully builds the tension and the plot gradually draws us into the heart of the Monks grand designs. Although the conclusion does fall back on some rather familiar tropes, it nevertheless provides a satisfying resolution to the trilogy overall. Toby Whitehouse’s intricately crafted script, together with the strong direction from Wayne Yip, ensures The Lie of the Land presents an extremely challenging adventure for the Doctor and his companions, and an exceptional finale to this thrilling mid-season trilogy. Been looking forward to the return of the Ice Warriors! 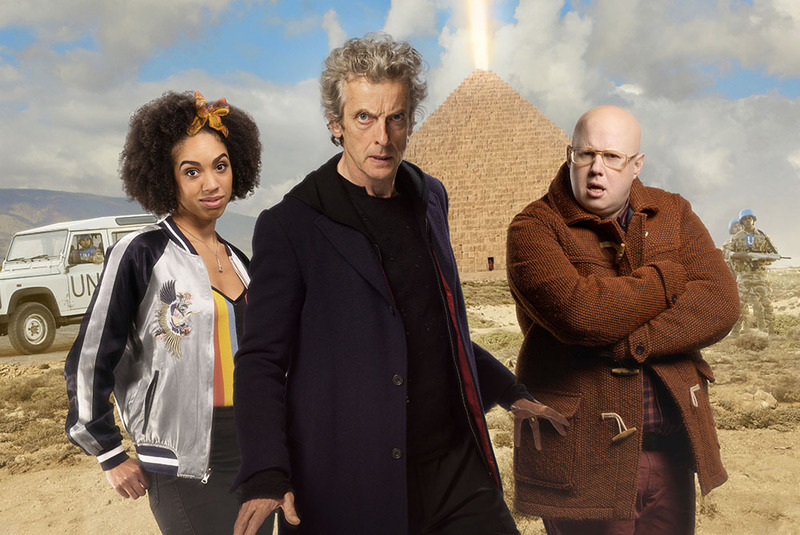 The Doctor, Bill, and Nardole confront an alien invasion in The Pyramid at the End of the World, but its not like any the Time Lord has ever seen before. There’s a 500 year old pyramid in the middle of a war zone, the Chinese, Russian, and American armies are poised to strike, but the pyramid wasn’t there yesterday… Intrigued by the mystery, the Doctor and his companions must do everything they can to avert the impending disaster, but bizarrely for the conquest of Earth to begin these aliens need the consent of the human race first! 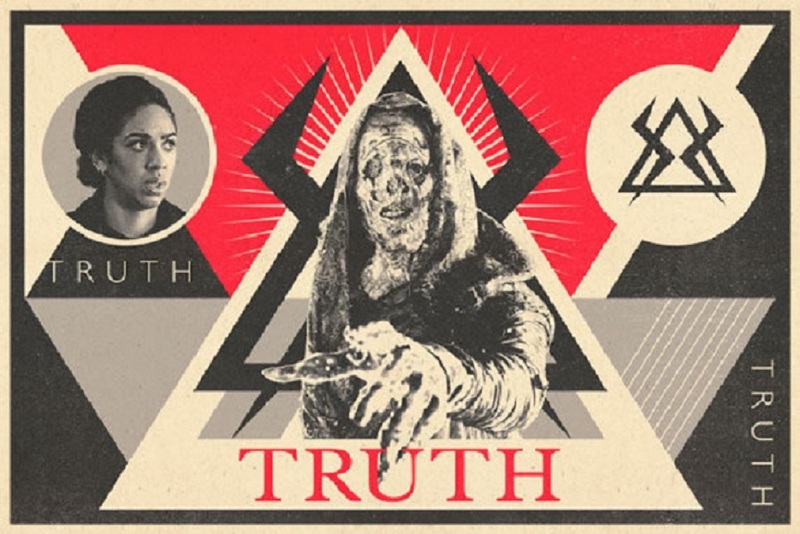 As the seventh episode of series ten, The Pyramid at the End of the World certainly has one of the most intriguing episode titles so far in this new series of Doctor Who, and it reunites the co-writing partnership of Peter Harness and Steven Moffat that brought us The Zygon Inversion! Peter Harness, the writer of Kill The Moon (2014), The Zygon Invasion, and The Zygon Inversion co written with Steven Moffat (2015), now returns with his third story for Doctor Who, The Pyramid at the End of the World, which is also just happens to be directed by The Zygon Invasion / The Zygon Inversion director Daniel Nettheim. Following the startling revelations in Extremis the Doctor, Bill, and Nardole are now forewarned of the Monks elaborate strategic planning and must stand ready to face their invasion in The Pyramid at the End of the World. As the second part of the “Monk Trilogy” gets underway Bill’s love-life suffers another VIP gatecrasher and the blind Doctor takes to strumming lonesome tunes on his electric guitar in the TARDIS, but when an ancient pyramid suddenly appears in Turmezistan causing an international incident between the Chinese, Russian, and American forces, the UN calls on the Doctor (still hiding the weakness of his blindness from Bill) to act in his capacity as the President of Earth and help them confront the menace of the alien Monks. When every clock in the world suddenly jumps towards a countdown to doomsday, the Monks offer a terrifying proposition to save humanity from disaster (caused by a deadly biohazard that‘s been unwittingly created by scientists at Agrofuel Research Operations, a bacteria so lethal it will wipe out all like on Earth), but in order to avert Armageddon the human race must willingly consent to become slaves to their would-be alien saviours! The Pyramid at the End of the World shows Peter Capaldi at his best as the 12th incarnation of the Time Lord, with Capaldi turning in a terrific performance as the Doctor gradually becomes increasingly desperate in his attempts to stop the invasion of the Monks. The scenes as the Doctor confronts the Monk outside the pyramid crackles with menace, but the visually impaired Time Lord is unaccustomedly hampered by his aliment, and this time the odds seem impossibly stacked against him as he attempts to save the day. Pearl Mackie also excels as Bill Pott’s, who quickly notices something is wrong with the Doctor in this episode when the Time Lord urges the military leaders to coordinate their attacks on the pyramid. 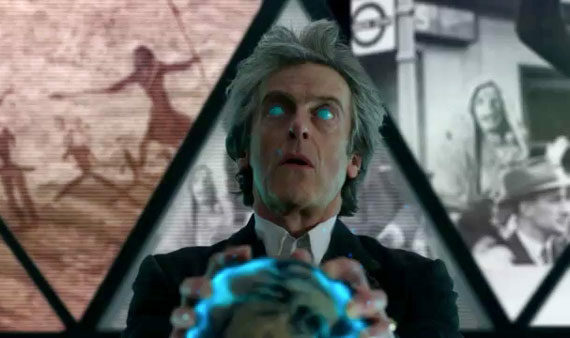 Bill gets to see a darker, more war-like side to the Doctor in The Pyramid at the End of the World, and this really shakes up the dynamic between them. 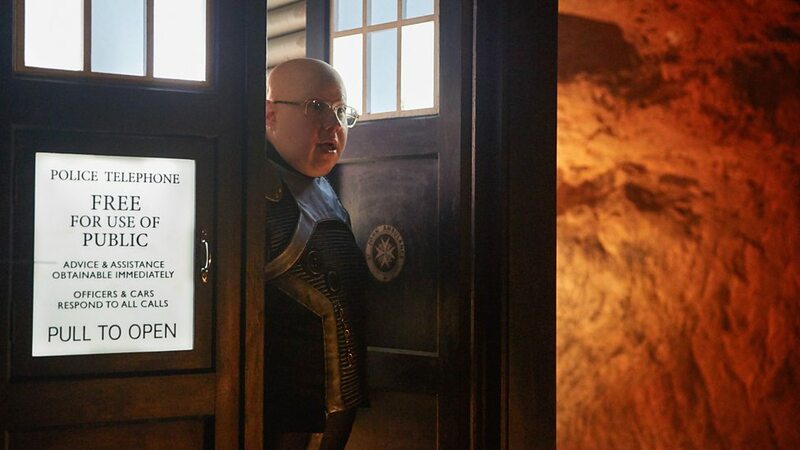 Matt Lucas did seem a little sidelined as Nardole in this episode, but his character does lighten the tone a bit during the bleaker moments as the Earth faces impending doom. Jamie Hill reprises his role as the Monk from Extremis for this episode – he also played the Foretold in Mummy on the Orient Express (2014) and appeared as a Silence in series six – and the eerie rasping voice of the Monks is provided by Tim Bentinck. In this episode we discover the Monks chose their undead form to look like us because this is how they perceive humanity. The Monks must also be invited to save the world, stating: “We must be loved,” because “To rule through fear is inefficient.” – which seems to indicate a somewhat unusual conflict of emotion and logic… These mysterious blue skinned creatures are chillingly realized. With their cadaverous bodies and the sinister way they speak with their mouths agape, they cast an extremely powerful presence whenever they appear, and are easily one of the creepiest monsters that we’ve seen so far in series ten. Along with the strong performances of the three leads, The Pyramid at the End of the World features an impressive supporting cast, which includes Togo Igawa (Secretary General of the UN), Nigel Hastings (The Commander), Eben Young (Colonel Don Barbbit), Rachel Denning (Erica), Daphine Cheung (Captain Xiaolian), Tony Gardner (Dogulas), Andrew Bryon (llya), and Ronke Adekoluejo (Penny). Filming for parts of this story also took place in Tenerife in the Canary Islands, a location previously used to represent the Moon (Kill The Moon), Skaro (The Magician’s Apprentice / The Witch’s Familiar), and Gallifrey (Hell Bent). Having nullified the militaries attacks with ease, the Monks invite the military leaders into they pyramid and use their bizarre future modelling technology to demonstrate Earth’s fate. Needing someone of extreme power to give them formal “consent” and provide the link to invite them to take over the world, the Monks power is revealed when first the UN Secretary General, followed by the three colonels, all fail to offer “pure” consent, and are disintegrated. While Bill remains at the Pyramid, the Doctor and Nardole use the TARDIS to reach Agrofuel Research Operations, where the Doctor is helped by the scientist Erica (superbly played by Rachel Denning) to contain and destroy the biohazard. 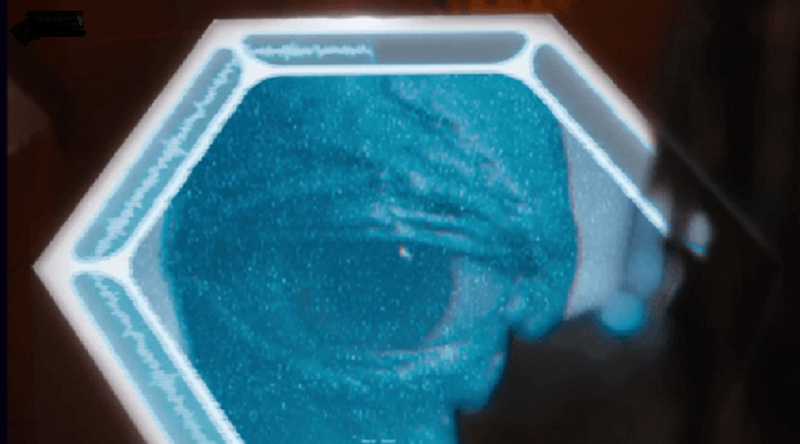 A nail biting countdown ensues when the Doctor gets trapped in part of the building that’s about to explode – and with Nardole in the TARDIS suddenly overwhelmed by the affects of the airborne contagion – the Time Lord is forced to confess to Bill that he’s been blind since the events on Chasm Forge. Desperate to save the Doctor at any cost, Bill offers her pure consent to the Monks, pure as she is acting out of love. 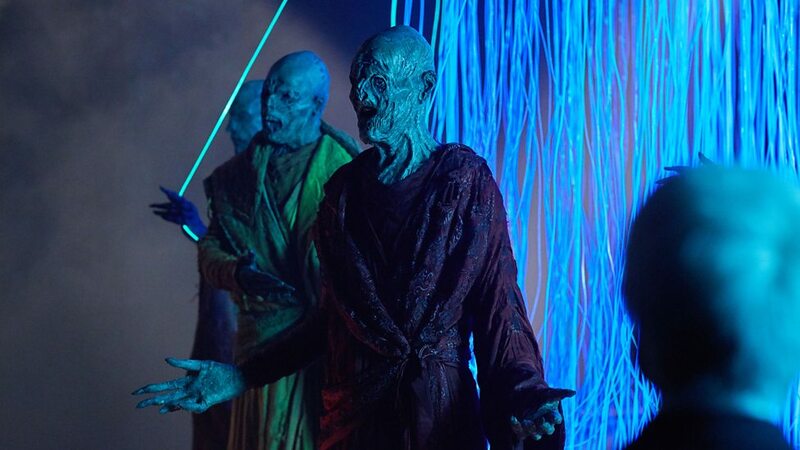 The Monks restore the Doctor’s sight, enabling him to escape from the room in the laboratory before it explodes, but in return the Monks will now rule the Earth… forever! Just as they did with The Zygon Inversion, the writing team of Peter Harness and Steven Moffat have crafted an exceptionally good Earth invasion story with The Pyramid at the End of the World. Though the pace of the story is a tad slower than expected, strong themes drive the narrative, and there are distinct hints of Torchwood Children of Earth and the 2016 film Arrival about the episode as well. Peter Capaldi also delivers a great monologue near the start, and later Bill has to make the most important decision since she began her adventures with the Doctor. Daniel Nettheim’s assured direction offers a powerful depiction of the epic scale of events, and delivers some particularly striking visuals featuring the episodes mysterious Pyramid. One thing’s for sure, the fallout from Bill “executive decision” looks set to cause a major upheaval, especially if that exciting Next Time trailer featuring Missy, Monks, and mass mind control is anything to go by! The Pyramid at the End of the World provides an enthralling and challenging middle segment to the “Monk Trilogy”. 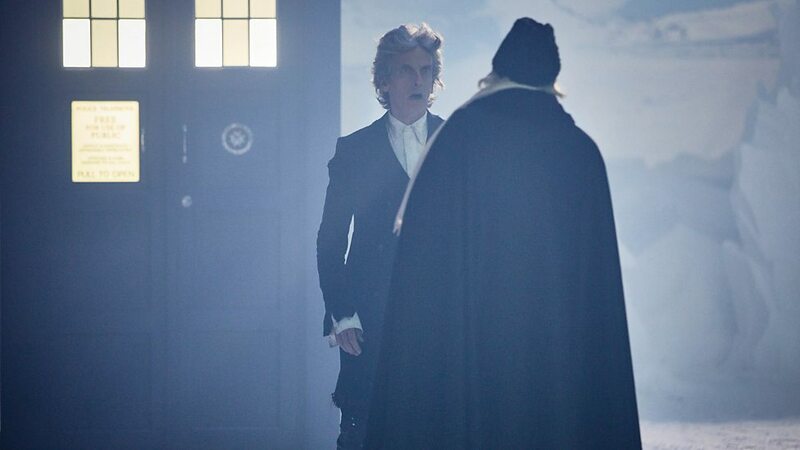 The Doctor’s valiant battle to save planet Earth from the fate that’s been so chillingly orchestrated for it by the Monks makes for a tense, edge-of-your-seat adventure, and it skilfully sets everything up for the thrilling conclusion of the trilogy in The Lie of the Land.